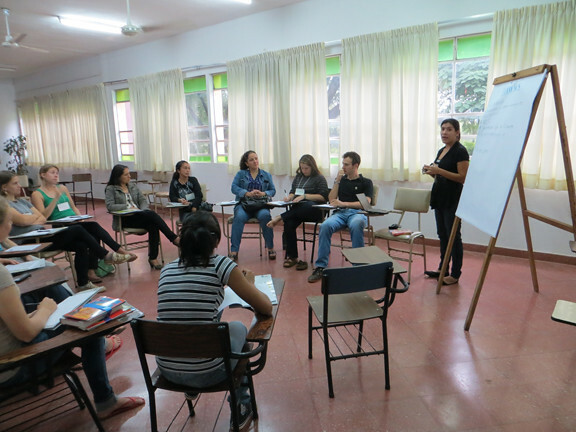 I had the pleasure of serving at the co-coordinator of this year’s Peace Corps Paraguay National Library Workshop, which was held May 3rd and 4th in Ypacarai. 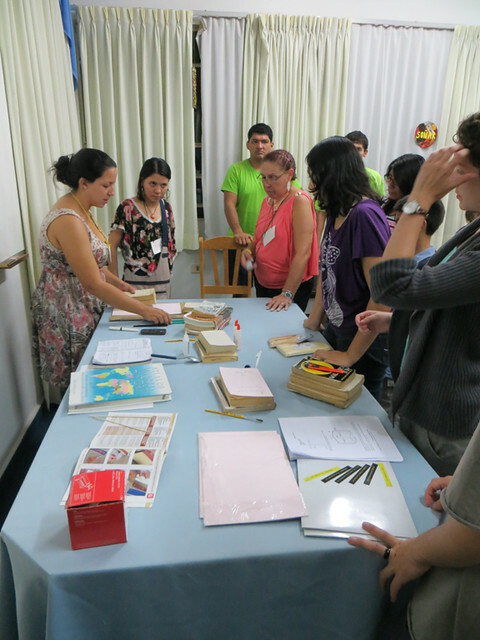 This event helped over 40 librarians and volunteers from all over Paraguay learn new ideas and strategies to improve their libraries. I attended the Library Workshop last year and because I find libraries so important to development, and work with one in my site, I volunteered to coordinate the event this year. 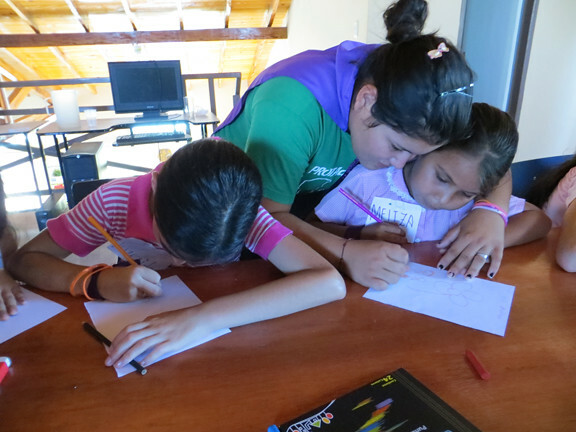 I recruited the fabulous Marilu and Stephanie to help serve as my co-coordinators. The three of us planned a jam-packed event, using community input to generate session content. 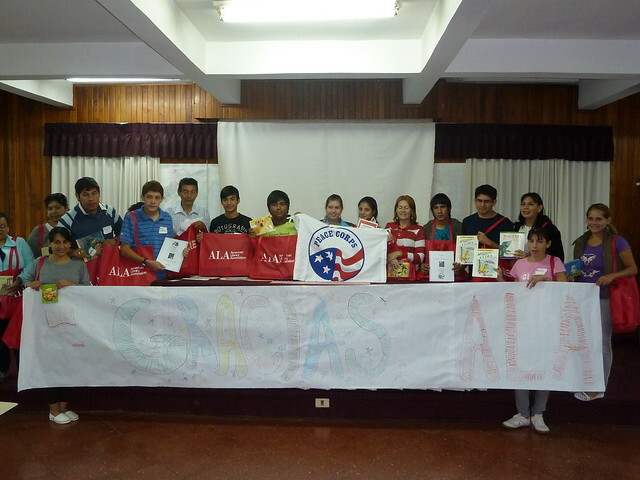 We also worked together to do a Peace Corps Partnership fundraising drive. Thanks to over 30 fantastic supporters in the United States, we were able to raise 70 percent of the funds to put on the event (the rest of the money was donated by local community members). 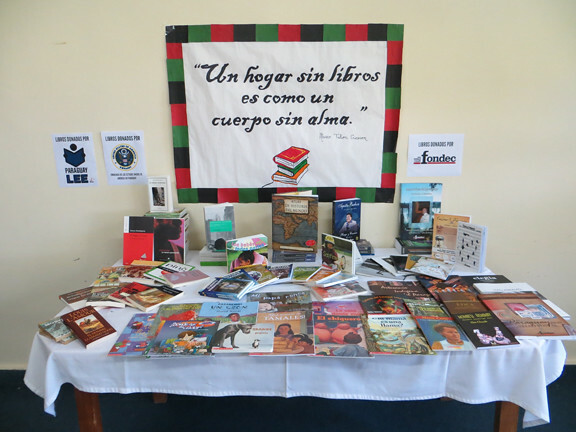 Additionally, we received support from local organizations, including the National Secretary of Culture, Fondec, and the United States Embassy in Paraguay, who generously donated books which we raffled off throughout the event. A small selection of the more than 400 books that were donated to the event! We began the planning process for the workshop last October, sending out a survey to stakeholders to get ideas on session topics for the event. We also started the fundraising process. 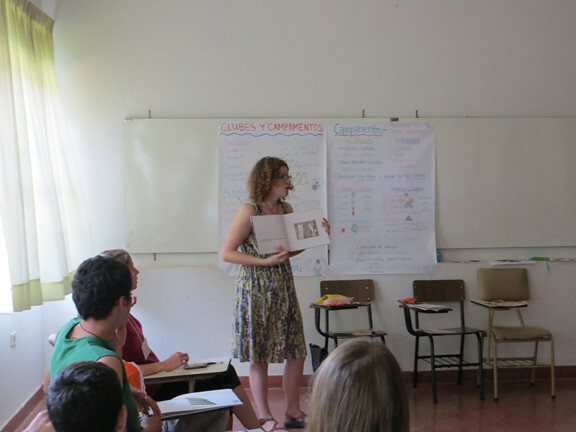 Early this year we began to flesh out the schedule and find other Peace Corps volunteers, as well as Paraguayans to present at the workshop. I then got to work planning my own sessions (I presented or co-presented 4 times!). In the weeks approaching the event we called all hands on deck to make some fantastic low-cost decorations (thanks Vicky and Molly for your help!). We were able to donate these posters and displays to attending libraries. We also got to use them at the event to show how something very low cost can make a big difference in the attractiveness of a library space. 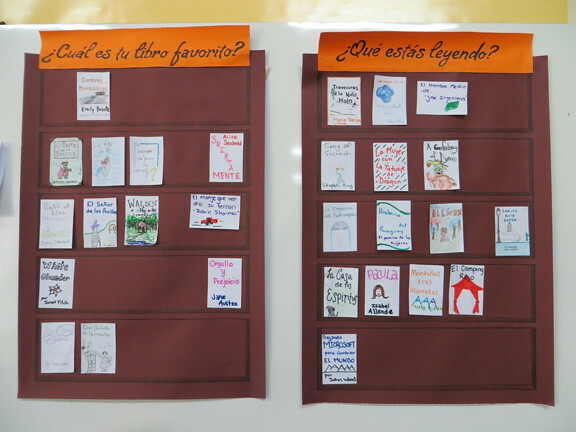 Interactive display asking attendees to put their favorite book and what they are currently reading on these bookshelves. 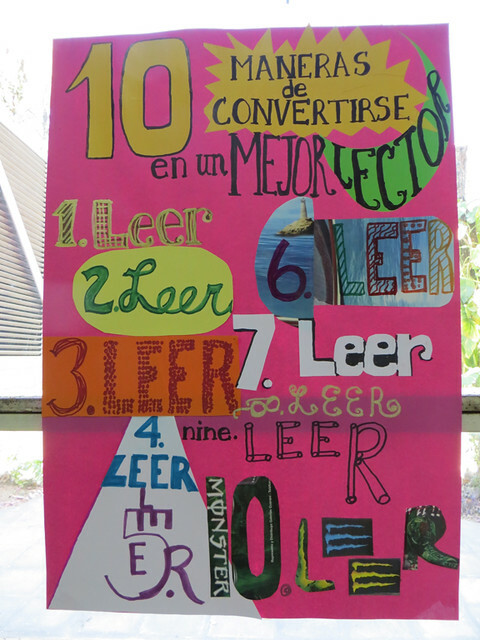 10 Ways to Make Yourself a Better Reader poster. You’ll notice that 1 to 10 all say READ. Quote from one of my favorite books, La Sombra del Viento (Shadow of the Wind). These 3-D letters saying READ also served to hide all the cords and whatnot on the a/v table. 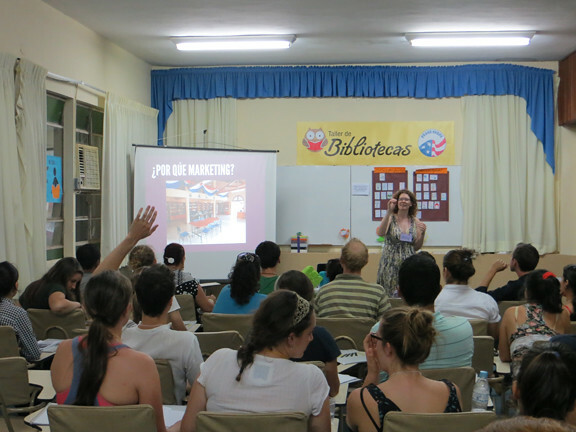 During the event we had presentations on the responsibilities of a librarian, creating welcoming and attractive spaces, promoting reading (through camps, clubs, theater and homemade books), library marketing, book repair, digital cataloging systems, library organization, obtaining donations, and finding community resources. Stephanie, Marilu and I do a little acting to start off the workshop, demonstrating the characteristics of a good (and bad) librarian. 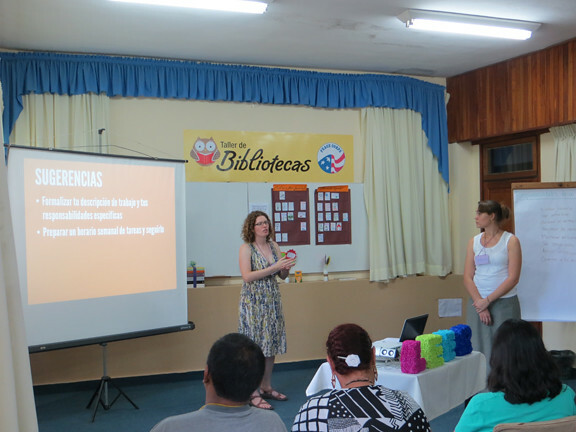 Stephanie and I present the responsibilities of a librarian and how to make your library a more attractive space. A presenter from the National Secretary of Culture talks about national resources to promote reading and culture. 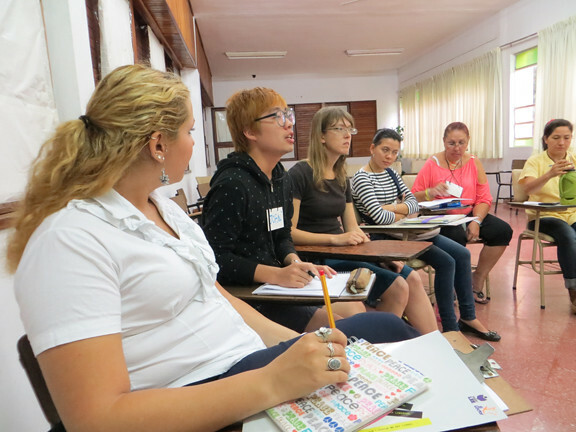 Participants get into Marilu’s small group session on using theater to promote reading. 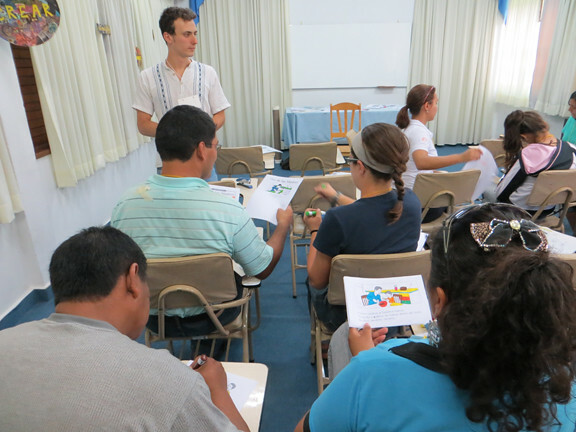 I present a small group session on promoting reading using camps and clubs. 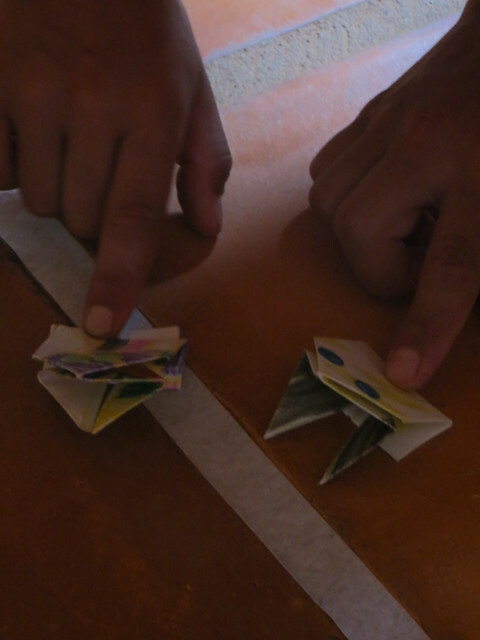 Ian led a small group session on using homemade books to promote reading. My session on library marketing. Connie and Meg’s hands-on book repair session. Tom presents on donations and fundraising. Marilu presents on generating community support. 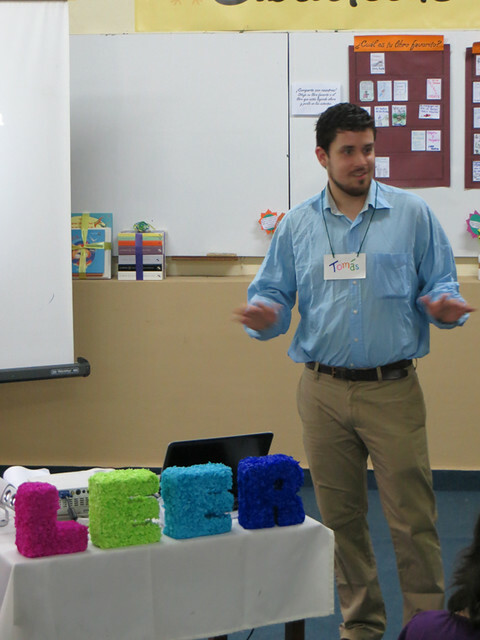 The closing speaker, author Moncho Azuaga, discussed the importance of libraries in Paraguay and how libraries can create life-long readers. 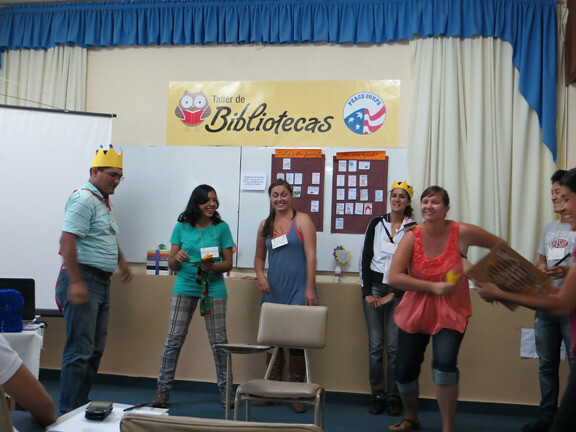 Moncho Azuaga talks about libraries in Paraguay. We had some big raffle giveaways at the end of the event, so that librarians left, not only with new ideas, but with some great new books for their patrons. 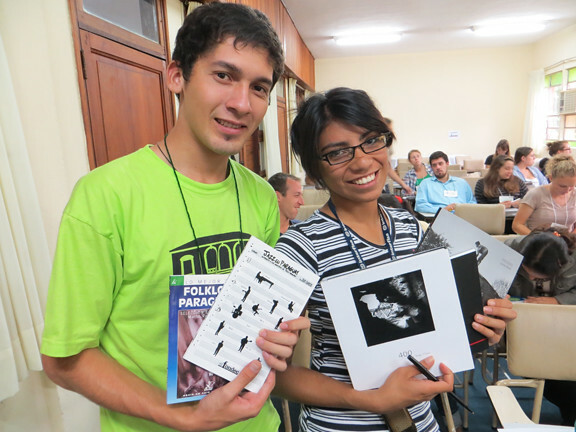 Participants Joaquin and Vivi with new books for their library. 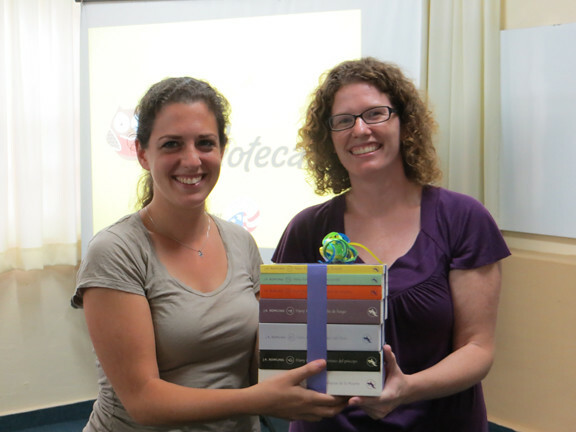 Sara won a copy of the Harry Potter series in Spanish to bring back to her community. Participants gave the workshop high marks and left feeling motivated to apply their new knowledge and skills back in their communities. 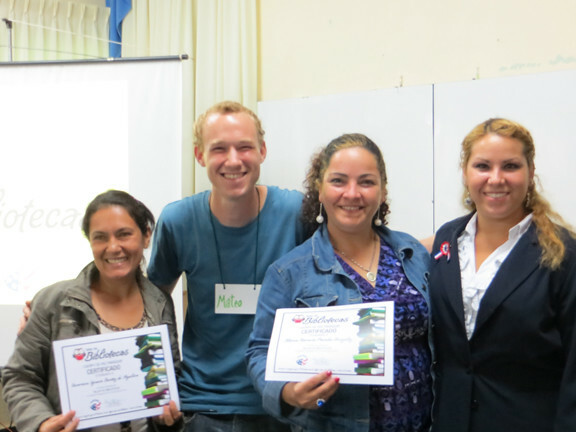 Participants from Capilla Cue with their certificates, pose with their volunteer Matt and our awesome Peace Corps Literacy Coordinator, Claire. I had very little experience with libraries before attending this event but I will definitely put this new knowledge to work organizing writing contests and theater events in my library. In my community we don’t have a library, but this workshop provided me the help I need to complete my dream of starting one. I am leaving this event very motivated. I want to organize the library, make the room more attractive, restart the reading club and show other organizations how to generate support for the project. 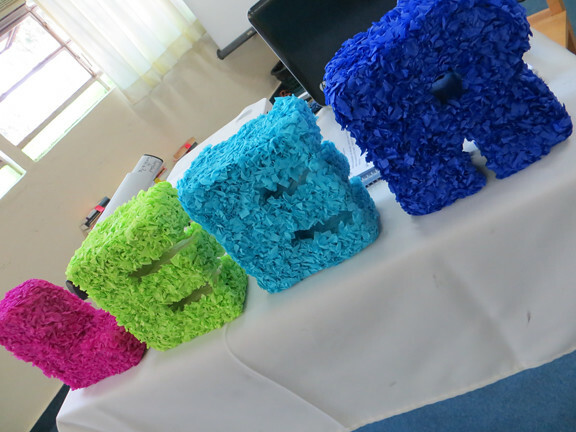 This workshop motivated me to realize that you can do many activities without having many resources. An employee of Paraguay Lee (Paraguay Reads), an NGO that promotes reading in Paraguay, attended the event and was so impressed that her organization has expressed interest in replicating the workshop all over Paraguay. I hope this comes to fruition. 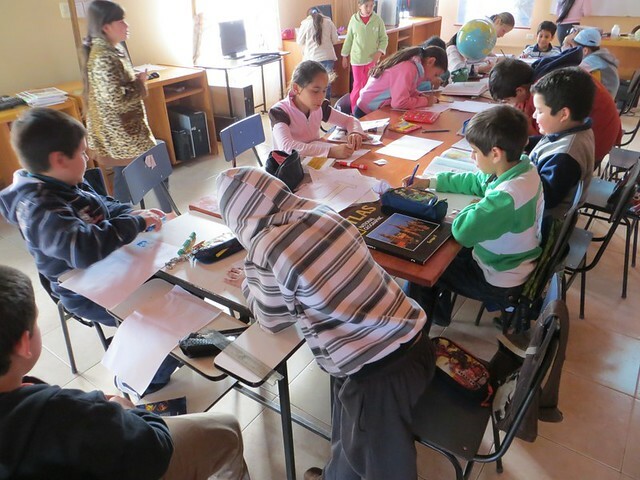 Of course, none of this would have been possible without the help of all of the donors to our Peace Corps Partnership grant. 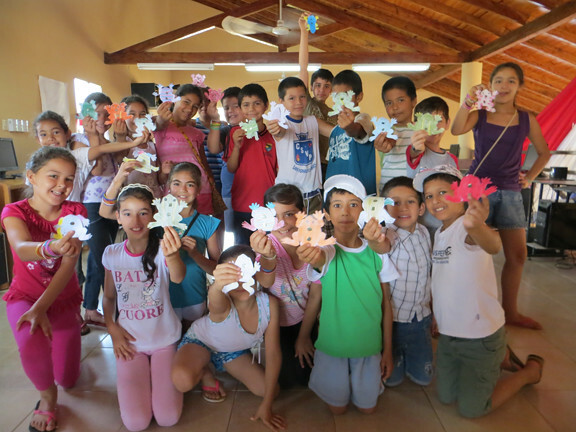 Marilu, Stephanie and I would like to say a great big THANK YOU to each and every one of you. It was incredibly touching to receive your support. 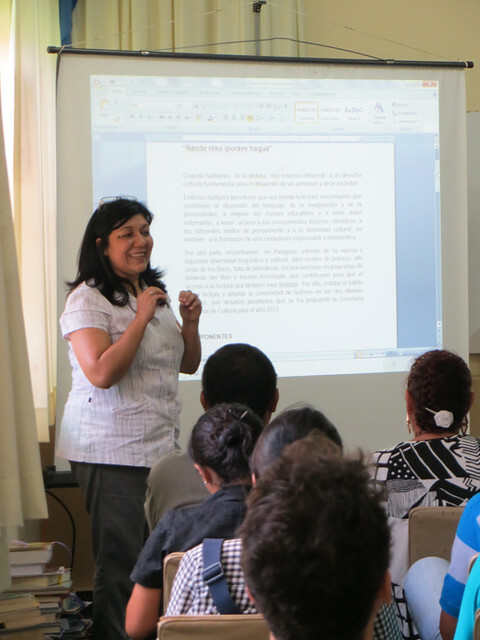 We want you to know that your donations helped librarians from all over Paraguay gain new skills, as well as the motivation and empowerment to go back to their libraries and spark an interest in reading among the members of their communities. 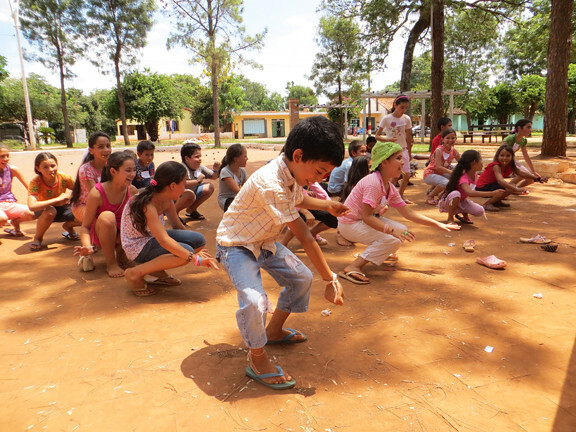 Kids and youth across Paraguay will especially benefit, with more friendly and accessible libraries, and new programming, such as clubs, camps and theater. The event participants can say this way better than me! 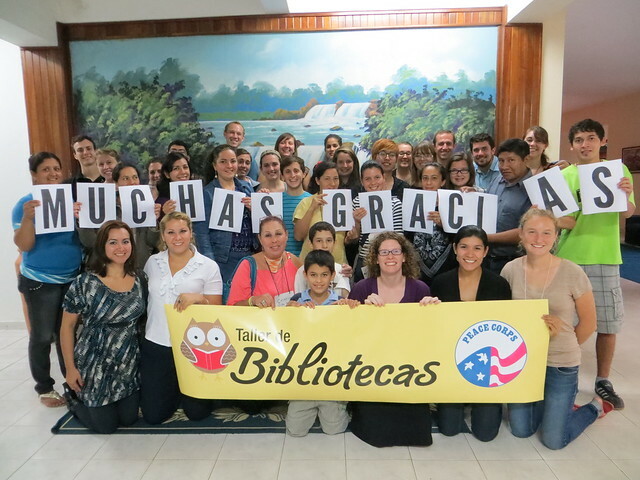 Muchas gracias (many thanks) to the incredible donors who helped make this event possible! This was an incredibly rewarding project for me to take the lead on and I look forward to watching this workshop continue to flourish in the coming years. 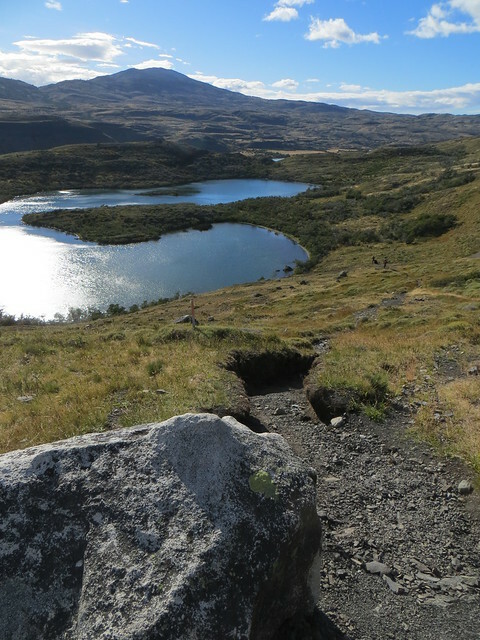 We awoke on day 2 of our Torres del Paine “O” trek to blue skies punctuated by fluffy white clouds. 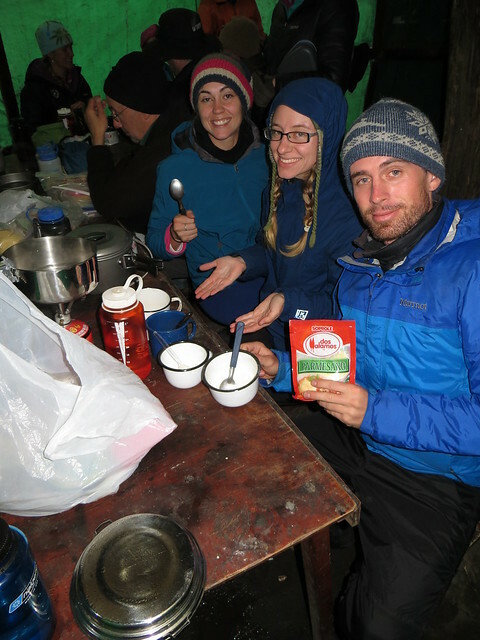 After packing up and eating some oatmeal surprise (surprise: coconut flakes, raisins and cinnamon) we started the 18.5 km trek to Refugio Lago Dickson. The trail started innocently enough along the river. Lovely start to the day along the winding trail. Eventually we hit Laguna Alejandra and our first real climb of the trip. Though rather pathetic in retrospect, this short series of switchbacks was the first time I’d have to do any significant uphill with my pack. I took a lot of “photo breaks” (aka take a photo to pretend I’m not just incapable of moving another step without a short rest) and was happy to take in the scenery. Eventually you come over a ridge and are hit with a beautiful view of Lago Paine, with a bunch of picturesque mountains behind. During this section I caught up with John and Gabe and we walked together for awhile while taking about our past lives. John had a pretty great series of adventures under his belt and it was fun to hear about working everywhere from Northwestern University to a printing studio in Paris. Lago Paine was the backdrop as I talked to John and Gabe. We hiked on, descending to a nice pile of building materials (they were constructing a new bathroom near the ranger station) that was a perfect seating area to grab lunch (and gaze at birds and waterfalls nearby). There we regrouped then set off for a final push to Lago Dickson. 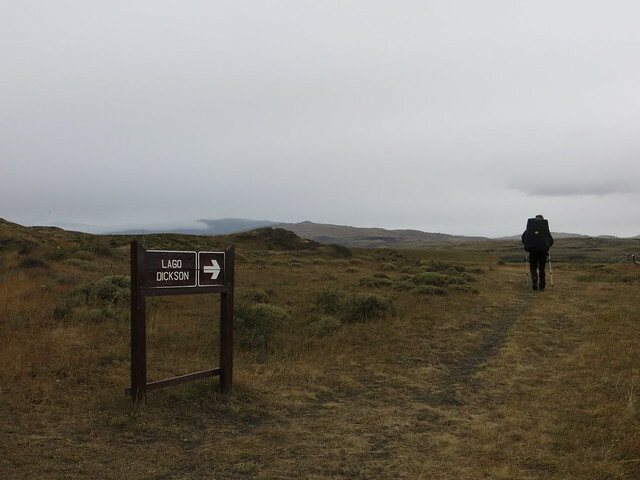 We crossed open grasslands and hopped a few streams before slowly climbing a moraine ridge. At the top of this ridge Lago Dickson finally appeared below, with beautiful mountains and glaciers towering above. In an open meadow beside the lake we could see our destination for the night: the refugio and campground. Lago Dickson appears! The campground and refugio are on that open space in the middle of the lake. We made quick work along the ridge then down a steep set of switchbacks to reach the meadow. 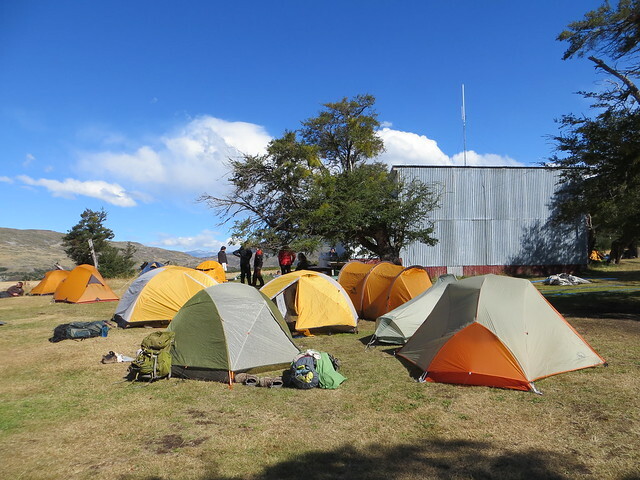 Unlike Puesto Serón, Dickson featured a lot more open space to put tents, which despite a large number of campers, felt fairly private. Steph and Julie come into camp. We set up on our own little patch of grass and relaxed for the afternoon (we even saw a group of Chilean cowboys wrangling horses). John and I did a little birding and explored the shore of the lake, but crazy winds made for less than stellar birding conditions. Exploring Lago Dickson with John. Not many birds, but beautiful views. The winds also complicated our dinner preparations later. 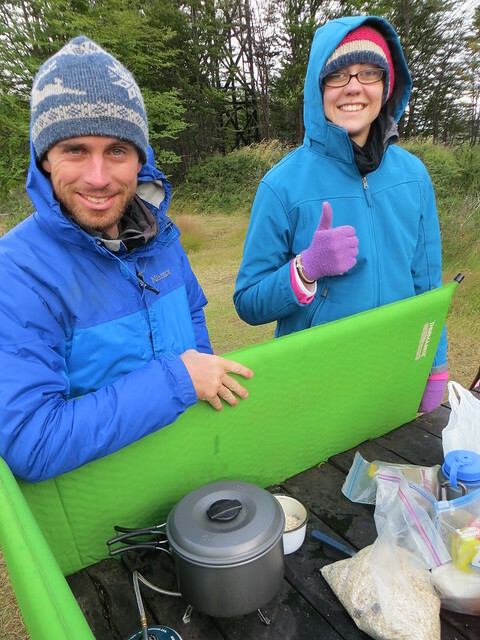 We decided to create a human windwall so we could make a second batch of lentil surprise (we improved on this system with a sleeping pad windwall in the morning – less manpower needed!). Unfortunately, during dinner preparations it started raining pretty hard, which meant an early retreat to the tents to escape the weather. I passed out pretty early, waking to a beautiful rainbow over camp the next morning. Lago Dickson rainbow send off. 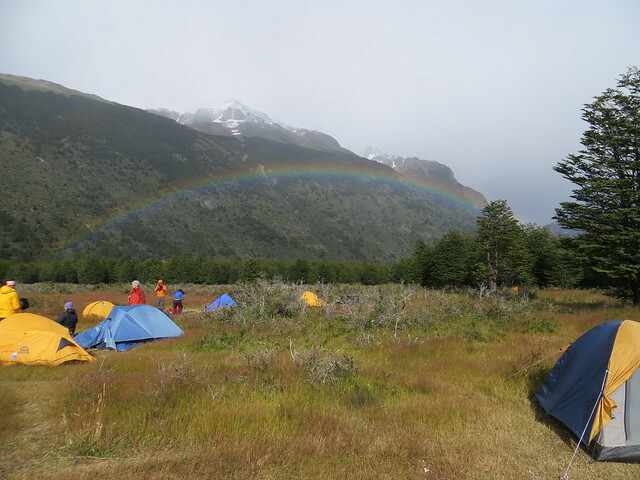 After cooking up breakfast while gazing at a rainbow, and messing around with Steph’s pack, we set out on day 3 to Campamento Los Perros, 9 km away. This day’s short mileage was going to provide us with a nice break before the big day, Day 4, the pass. I’d been dreading/focusing on day 4 in my brain for so long that I didn’t really do a lot of research on what was waiting for me on day 3. Turns out, it was probably my favorite day of the trip. Day 3was almost entirely a walk in the woods. I walked mostly solo this day and my soul felt at home the second my foot hit the wooded dirt path. Surrounded by the sounds of the forest and the overpowering green-ness, I couldn’t get the smile off my face. Some lovely openings in the canopy with pretty views couldn’t hurt either. Throw in a rushing stream…oh screw it, you had me at hello. 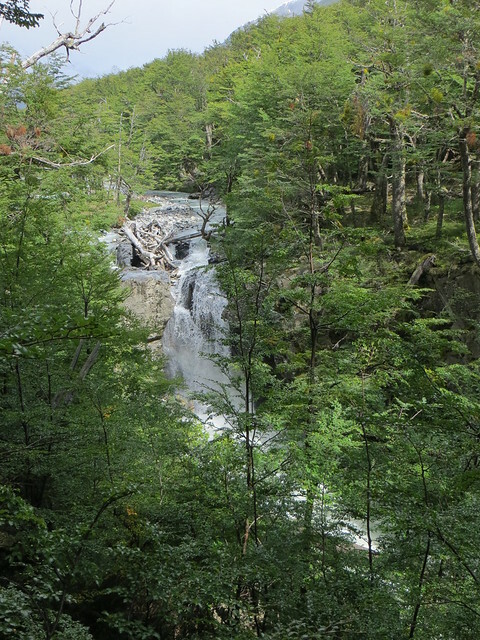 I passed a pretty waterfall, Salto Los Perros midway through the hike. 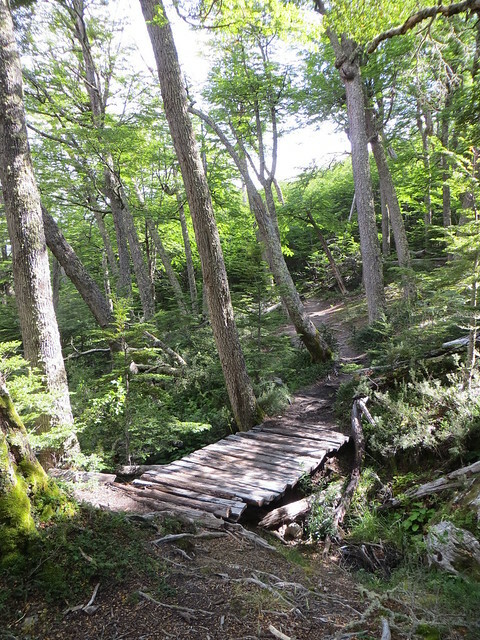 From there we continued in woods until we neared Laguna de los Perros. 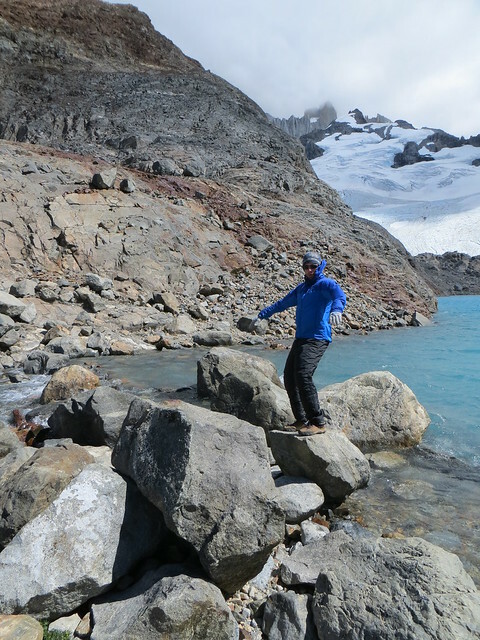 At that point the winds got pretty crazy (so crazy I didn’t want to take my camera out to take a photo of this little glacial lake and its feeder glacier). The last 15 or so minutes of the day involved walking on rocks up towards the laguna and then along the river flats. 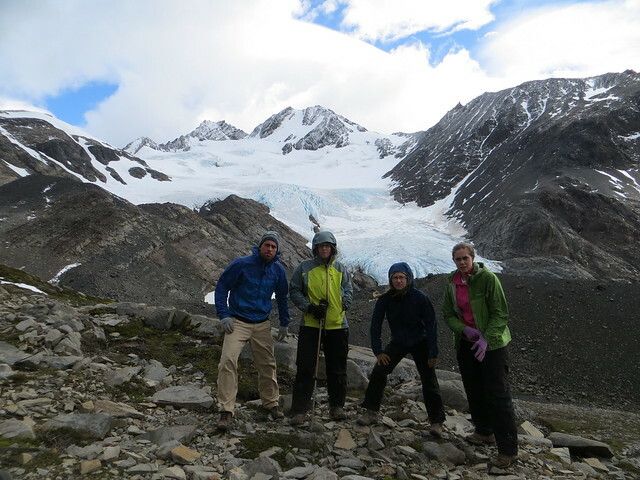 This glacier is visible on your final rocky push into camp. Just when I thought I didn’t want to take another rocky step, I came upon another patch of woods, which happened to be our destination: Campamento Los Perros. JT found us some nice places to set up camp and then we took advantage of our first cooking shelter on the trail (Serón and Dickson didn’t have these). The shelter was a great place to escape the wind to cook, warm up and talk. Dinner is served in the cooking shelter: couscous with Parmesan cheese. 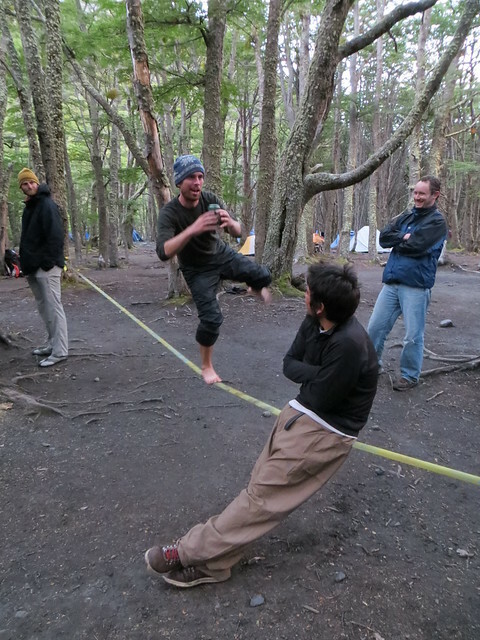 After we cooked up dinner, a Chilean employee set up a slackline in camp, and Chris (can I just call him Mr. Incredible?) made the thing look like child’s play. Chris: as if I’m not awesome enough, I will slackline for beer, then drink that beer while balancing effortlessly. 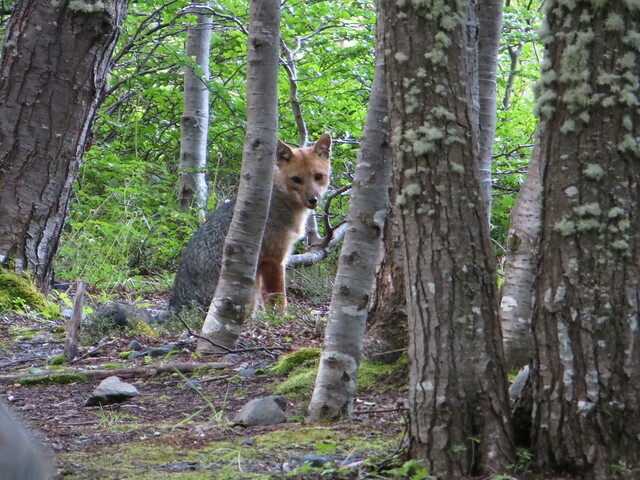 While watching Chris own the place, a fox meandered into camp looking for food. I followed him around for a bit to get some photos and just take in his beauty. Then I made sure my food was secure before calling it a night (as much as I enjoyed the fox, I didn’t want a middle-of-the-night visit from him). Day 4, the stuff of legend, finally arrived. I told Stephanie, our first time backpacker, and myself (not in the best shape of my life), that if we could make it through day 4, we were golden. Thankfully the weather chose to grant us great conditions for ascending John Gardner pass, the day’s challenge. The trail started out with some difficult to navigate mud pits and climbed near continuously all morning. From mud, we transitioned to rocks (not sure which I hate more) and wind, but the views all day were lovely and the trail easy to follow. We had perfect weather for the pass, which meant great views all day. Steph on the rocky trail, still in possession of soon-to-be-missing striped hat. 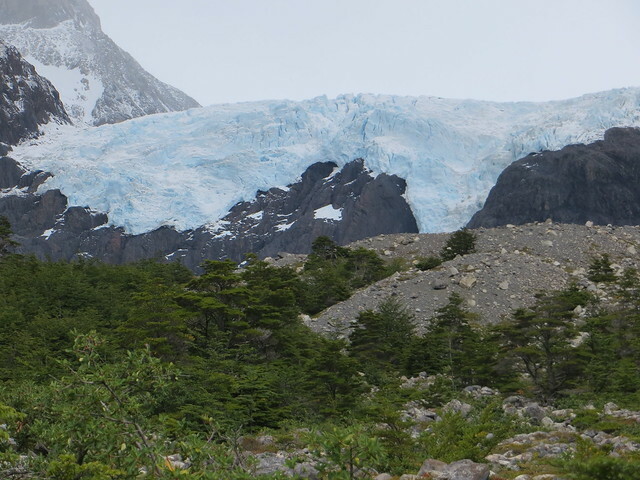 As we climbed toward the pass a small glacier was visible to our right on Cerro Amistad. 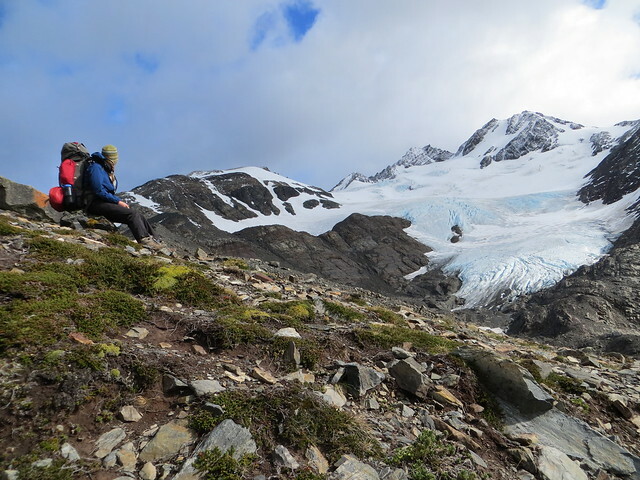 Julie checking out the glacier on Cerro Amistad. 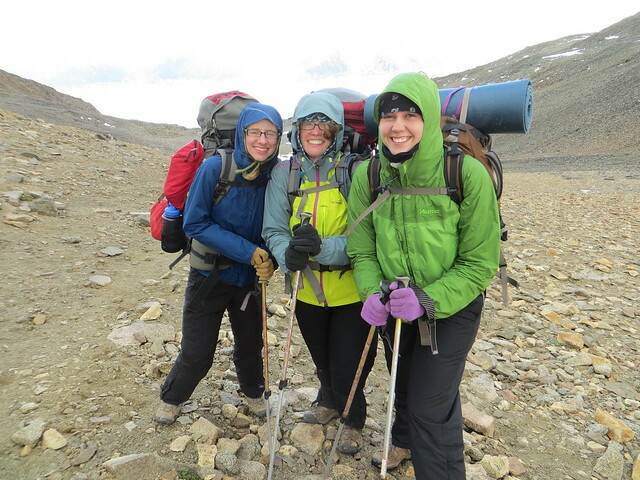 Julie and I crested the 1241 meter pass together, fighting a biting wind. 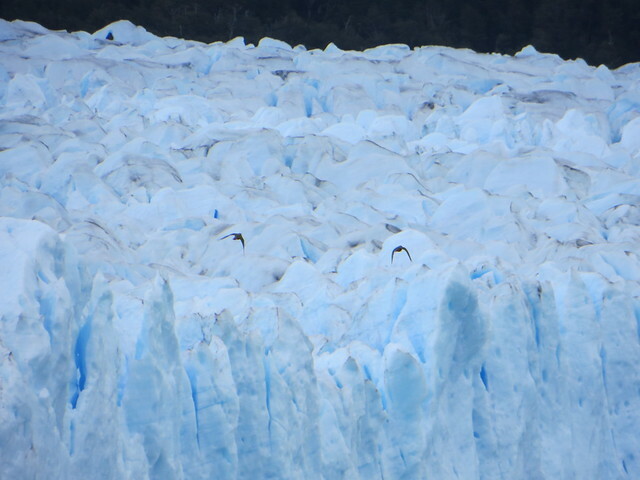 On the other side was the impressive sight of Glacier Grey, a sheet of ice enveloping the whole valley below. We gaped at the massiveness and beauty of it all. Me at the top of the pass! That mass of white behind me is Glacier Grey. Then we layered up and waited it out up top to cheer Stephanie’s first pass summit! She was less than thrilled about the rocky trail (“F— rocks”) and her upset stomach, but I think she’s currently happy we forced her to take a group picture up top. The girls on top of John Gardner Pass, Steph’s first (of many?). 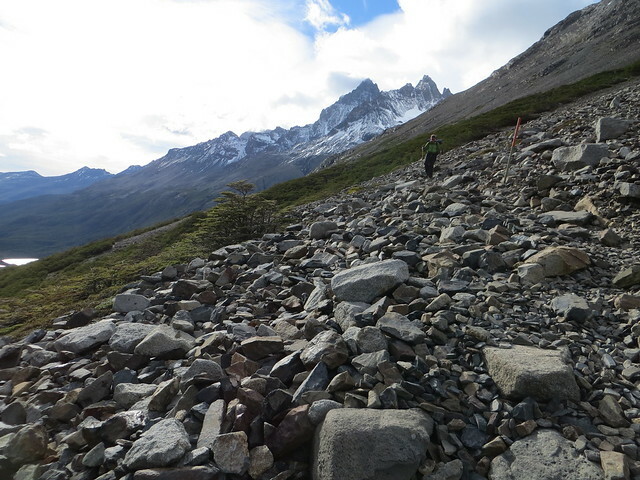 From the pass we had a long and steep descent into camp, at first rocky, then featuring lots of loose earth. The whole way down I was thinking I was extremely happy we chose to hike counterclockwise – better views and less intense ascent. 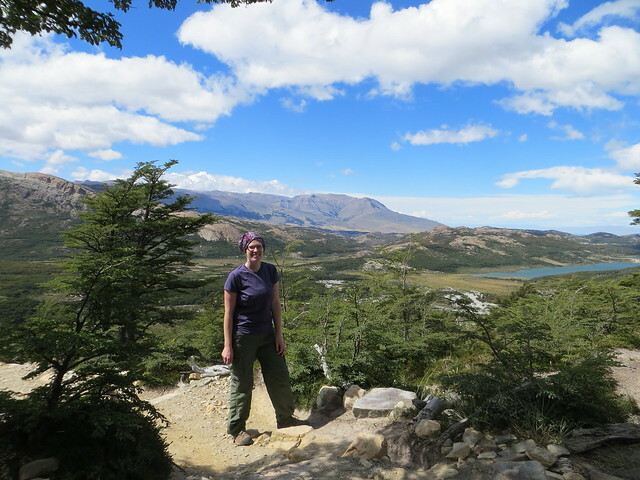 Taking in the views on the way down to Campamento Paso. I enjoyed the second part of the descent, again in woodlands similar to the ones I loved the day before. Taking a break in the woods! 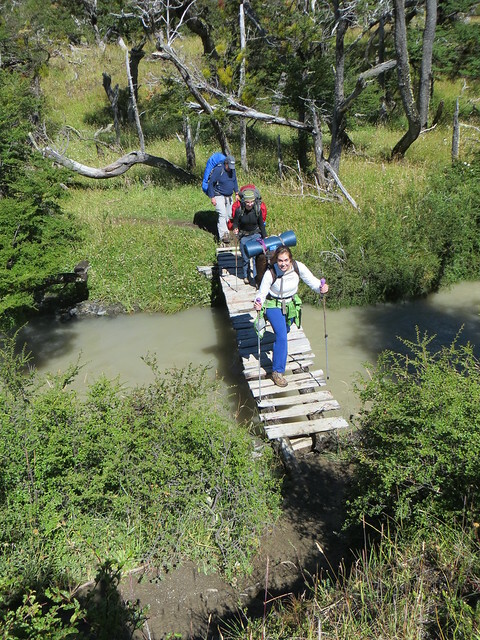 Bridge crossing near Campamento Paso. Eventually the woods opened up to a big rocky stream crossing. 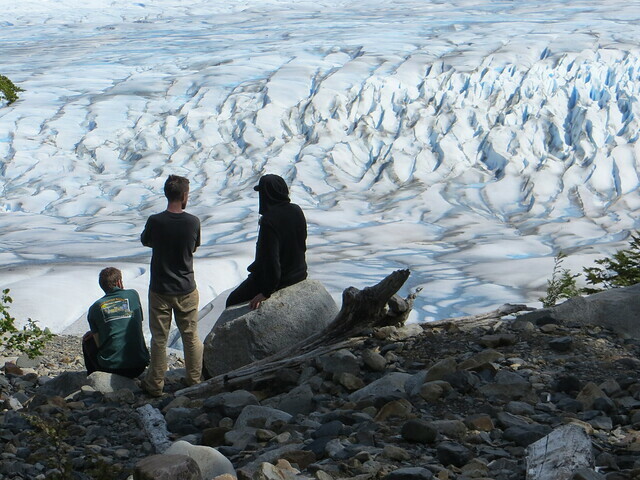 There I caught up with Ian, JT and Chris who were talking and enjoying the impressive view of the glacier. The guys taking a break with an impressive backdrop. 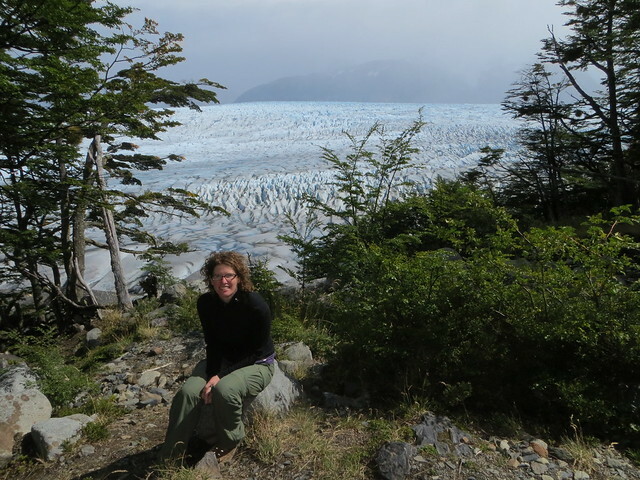 Me chilling out in front of Glacier Grey (just outside Campamento Paso). We chilled there for a bit before walking a short distance to Campamento Paso, a cool free campground in the middle of the forest. The weather was nice enough to let us get our tents up before it started raining. After some great food (ravioli reward for crossing the pass) and good conversation in the cooking shelter, it was another early night. Campamento Paso filled up as the evening went on. Check out the impressive drainage system our neighbors built around their tent (which had a space thanks to an OCD clearing project taken on by Erin earlier in the evening). Tips: Be prepared for wind to affect your cooking at Puesto Serón and Lago Dickson, as both do not have cooking shelters. 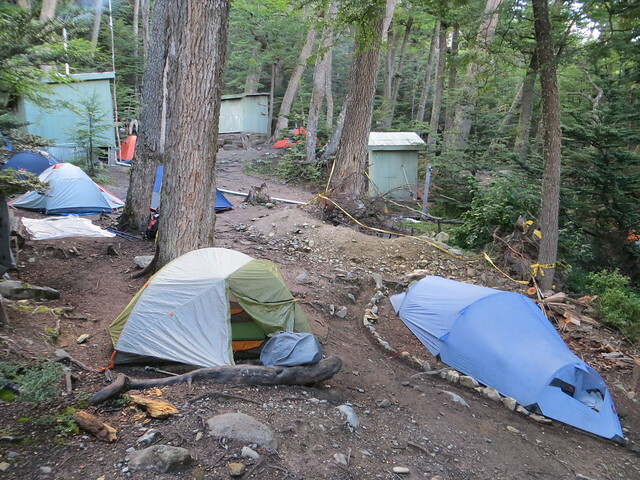 Also of note, at least during high season the staff at Serón and Dickson were rather haphazard at collecting camping fees (they supposedly come around to your tent at a certain point). You may find yourself making it out the next day without paying. I highly recommend hiking counterclockwise for a number of reasons, but the fact that you have an easier pass ascent is number 1! Less elevation gain and a much more gradual ascent. Also if you have trekking poles I would highly recommend bringing them on this trek. I shared a rented set (one each) with Julie, and they were great to have during windy periods (frequent) and descents (also frequent). 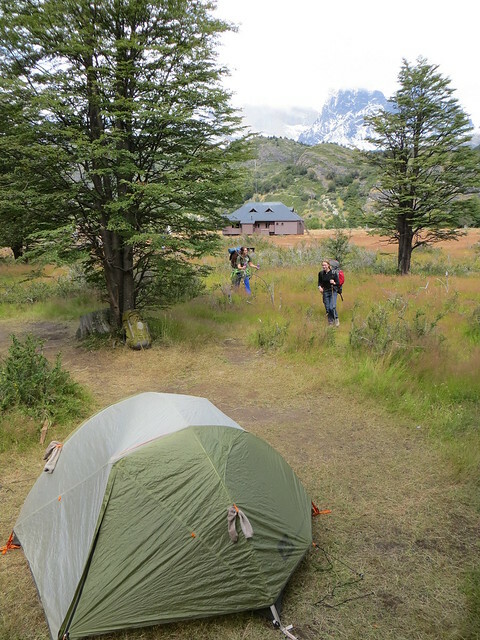 Campamento Paso is one of the few free sites left at Torres del Paine, and I rather liked it. 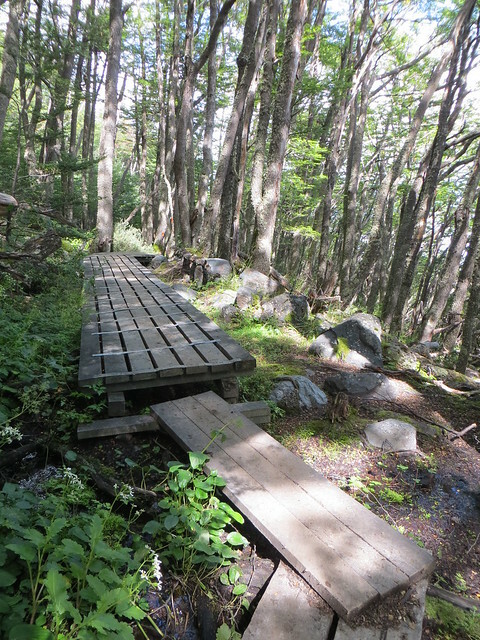 It features a number of dirt spots in the middle of the forest. They are of varying quality levels. To get the best choice (aka more level/less roots) try to set out early from Perros and make good time on the pass. 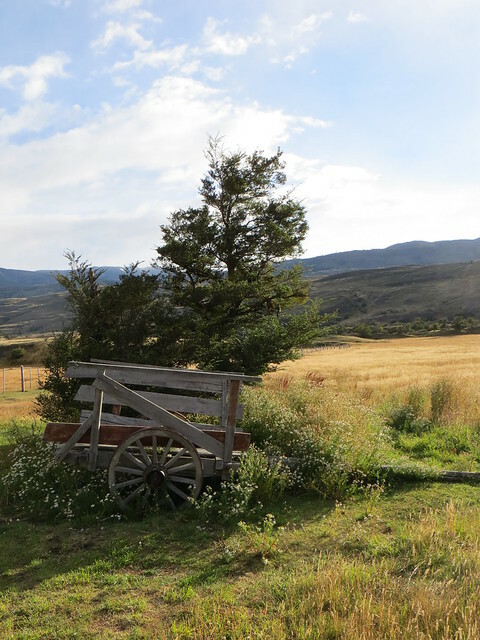 After crossing the border into Chile, we rode the bus a few kilometers down into the town of Puerto Natales, the gateway to Torres del Paine National Park. There we checked in at Erratic Rock hostel and started prepping for our planned 10-day trek in Torres del Paine. We decided to hike the “circuit” or “O”, a 7-to-10-day loop around the most scenic section of the park. Torres offers people who have money and don’t want to lug camping gear the option of sleeping and eating in refugios (hostel type sleeping arrangements and decent food) of varying quality levels. We decided to instead be frugal and carry all of our own food and gear to camp on the trail. This involved a lot of planning, especially in regards to deciding on meals for 10 days. No one in our group had done a backpack longer than 5 days, so we spent a good hour in the grocery store trying to figure out how much food was needed and how to manage its weight. 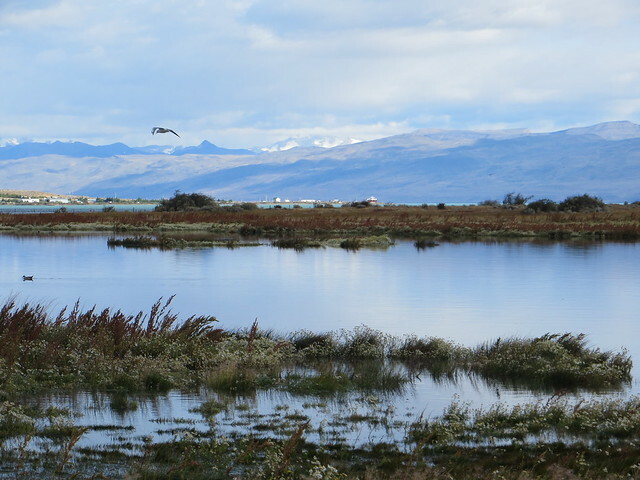 The view from Puerto Natales. We got a great night’s sleep at Erratic Rock, and then got up to catch the early bus into the park (which picked us up at our hostel around 7:30 am). The awesome breakfast spread at Erratic Rock. Not pictured: jolly owner off to the side cooking us omelettes. 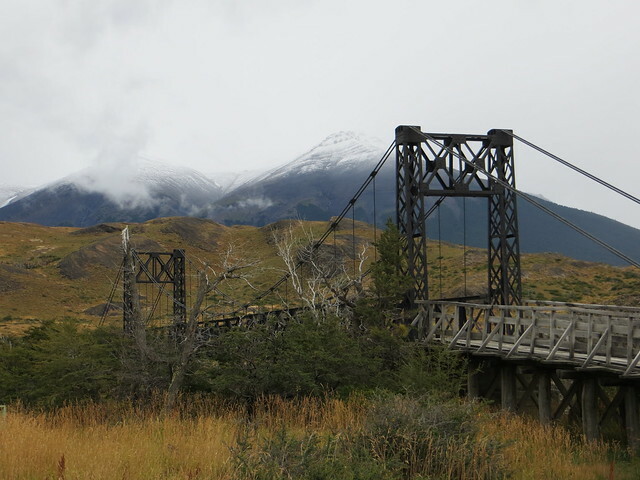 The park is a little under 100 km from the town of Puerto Natales, so the ride takes a few hours. While on the bus we met a fellow hiker named Ian, who was jealous of the awesome breakfast we received from Erratic Rock, and in need of a pen (which I seemed to be the only person on the bus in possession of). It turns out that Ian was planning to do the circuit as well and we ended up hiking and camping with him throughout the trip. The bus finally arrived at the park and we had to wait around until our bus was first in line to turn in our entry forms, pay the entrance fee (around $33) and watch a video on park policies/fire prevention. After all that was said and done, we were ready to start our hike. 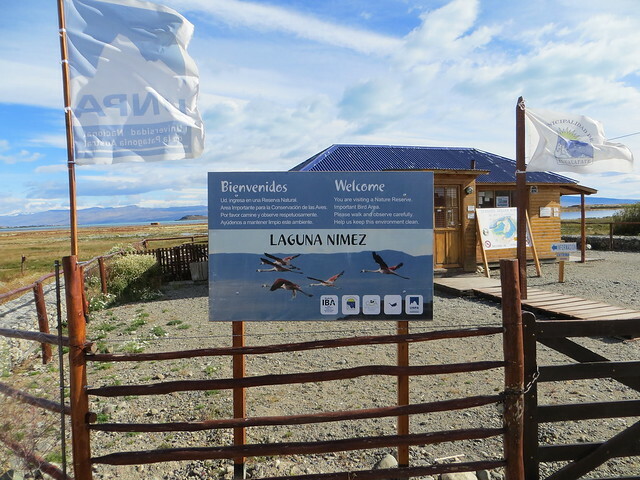 The circuit typically starts either at Hotel/Camping Las Torres (which requires you to get on a 2500 peso shuttle bus from the entrance station) or alternately from the Laguna Amarga entrance station (where we were). We decided on the alternate start, which involved walking along the road for a bit before hitting the actual trail. Map of the circuit, with day one, Laguna Amarga entrance station to Puesto Serón, marked in yellow. 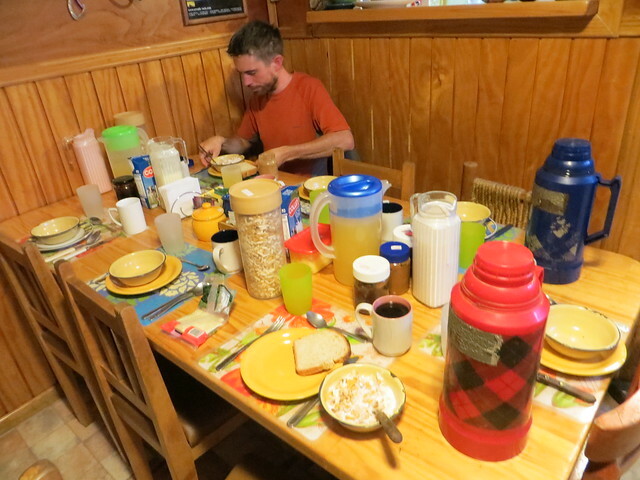 The crew put on our packs and set out on the trail with Ian, who asked us “How prepared do you feel for this hike?” I was feeling “medio-prepared,” as Paraguay is darn flat and this trip was double the duration of my longest backpacking trip. Despite the medio-preparedeness I was feeling ecstatic to be backpacking again. Despite the overcast skies, it just felt amazing to breathe the fresh air and look out at the scenery. We roped Ian into taking a pre-departure group photo and were on our way. Our pre-trek group photo (thanks Ian!). Crossing the bridges at the beginning of our hike. The actual “alternate” trail begins at this sign on the side of the road. The trail meanders across grassy open fields, while mountains loom off on to the left. 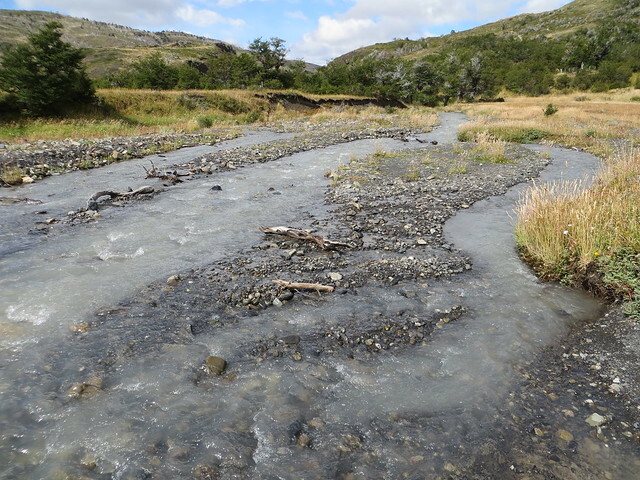 Eventually the path meets up with the river again, which you follow upstream until you join up with the main trail (coming from Hotel/Camping Las Torres). After the junction you pass some gates (take the ladder if you’re adventurous or don’t notice that there is in fact a gate) and ford a shallow stream. From there you walk through more fields to Puesto Serón, the campsite for the night. Stream crossing: I actually took my shoes off for this one. 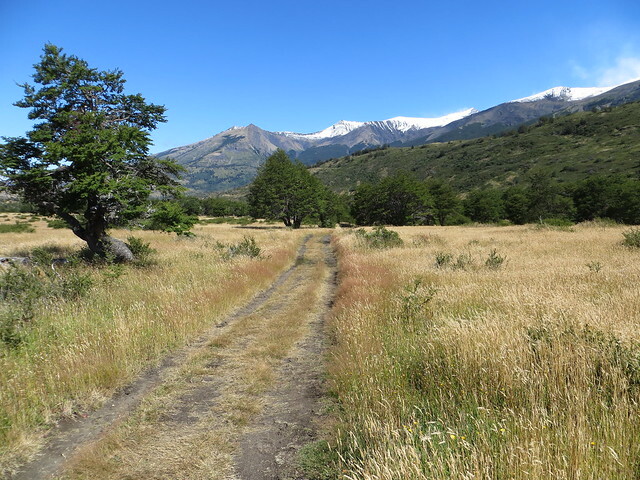 The trail heads off towards Puesto Serón, our campsite for the night. 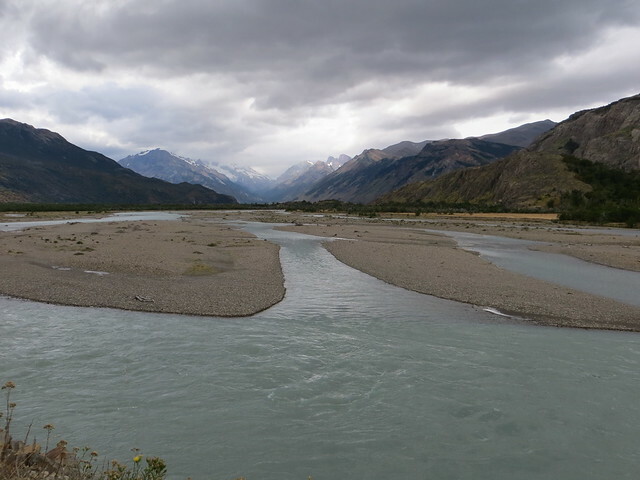 The hiking was easy and tranquil all day long, with lovely views of the river and mountains in the distance. 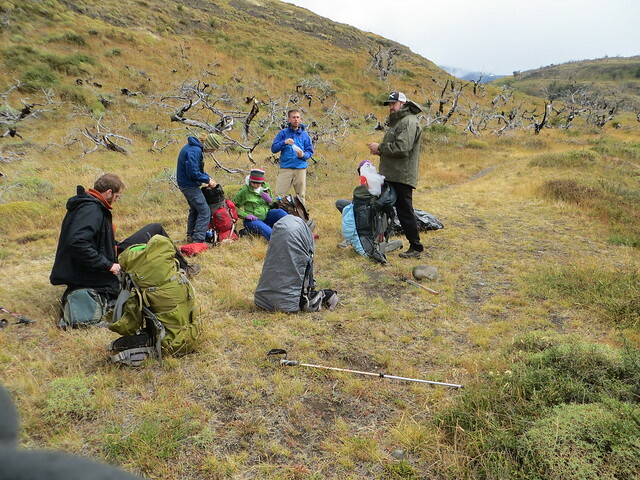 It began to drizzle within the first half-hour of starting the trek and a group ahead of us stopped to put covers on their packs. As we were passing Chris in our group and a member of the paused group both realized they knew each other and a warm reunion ensued. We were introduced to JT (who Chris knew from his Boulder college years) and his sister Erin, and eventually to their dad, Bob, who was a bit further back on the trail. They were super rad and had similar hiking plans as us. It became quickly apparent that we would be joining forces for the remainder of the trip. Lunch break with our new friends. Steph and Julie crossing a bridge with Bob. Reaching Puesto Serón was a bit of a surprise for me, as I’d never really backpacked on a very popular trail with designated camping areas. The location was a sea of tents. We quickly learned you just kind of found a flat spot and set up (and hoped that others arriving later didn’t set up nearly on top of you). We made a little 6-tent grouping with Ian, Erin, JT and Bob and spent the late afternoon relaxing and cooking up dinner (lentil surprise). I watched the birds around the campsite for a bit and then we all hung around sharing stories, and met other hikers (like John and Gabe, a father/son team who we also hiked with on-and-off all trip) before drifting off to the sounds of Journey and Tom Petty (Some of the Chilean’s had a presumably battery-operated stereo running well into the night. If they had worse musical taste, this probably would have bothered me). Old wagon at Puesto Serón. 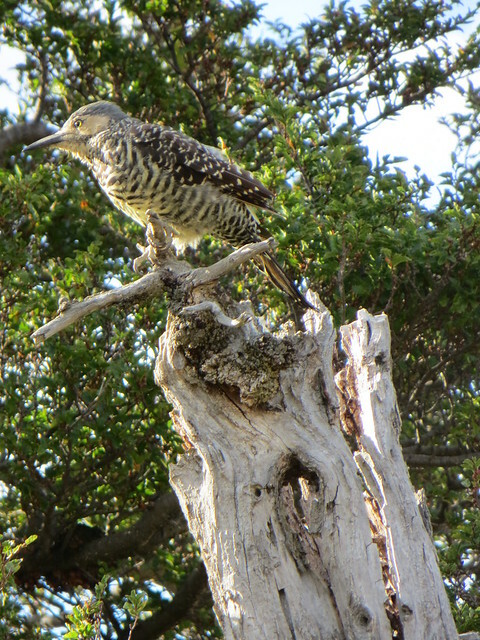 Chilean Flicker (Colaptes pitius) hanging out near the campsite. 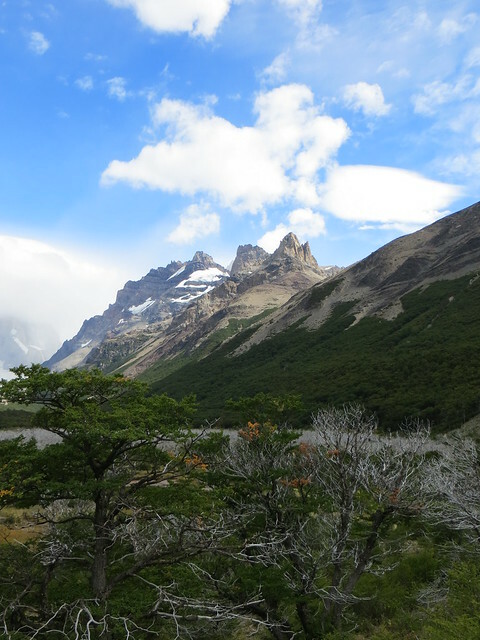 I’ll write more about the rest of our time at Torres del Paine in the coming days. Check out all of my photos from the park on Flickr. 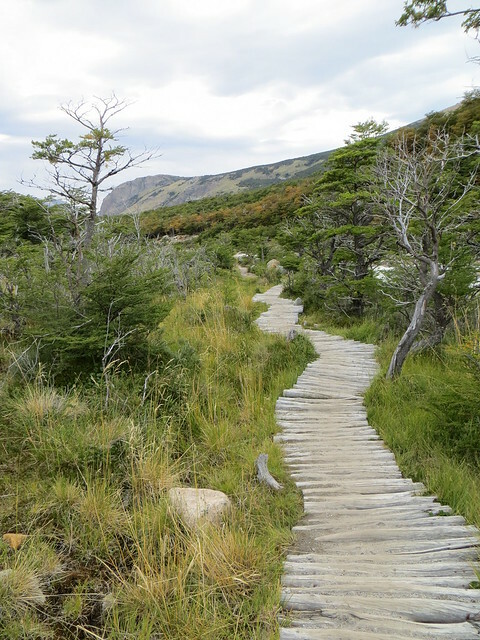 Go: Torres del Paine National Park – One of the most stunning national parks in the world and home to the famous “W” and circuit hikes. 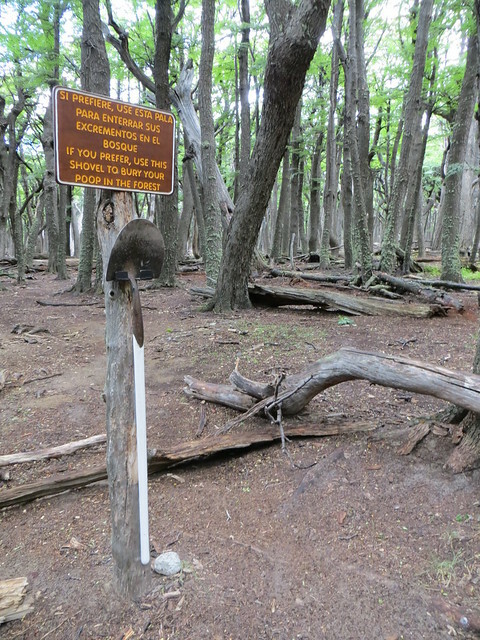 Hit up Erratic Rock’s free 3 o’clock talk (daily) to get a rundown on completing these hikes. The talk covers pricing, transport, food, camping and other general tidbits of usefulness. 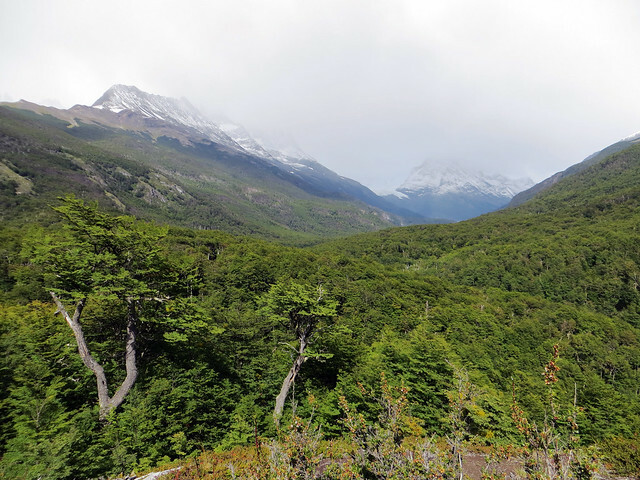 Refugios and most camping areas at the park are run by two private companies: Fantástico Sur and Vertice Patagonia. If you are camping and bring all of your own gear, you don’t need to make reservations in advance. Otherwise, use their websites to book early (especially during high season in January and February). Campsites at the refugio sites cost anywhere from 4000 to 8000 pesos per person per night. There is free camping at Campamento Paso, Campamento Italiano (“closed” at the time we visited) and Campamento Torres (as well as Campamento Británico a climbing site in the Valle Francés). 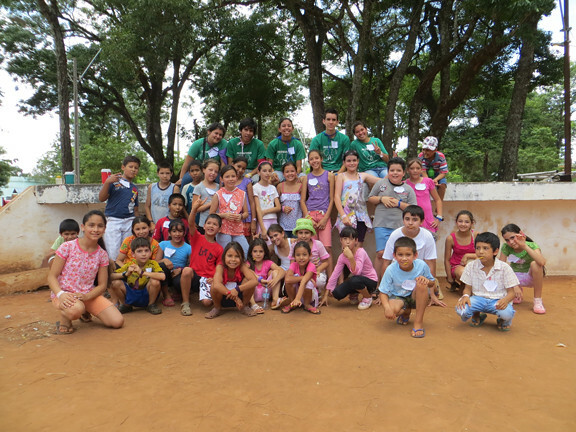 Some notes from my research: Campamento Francés does not exist and Campamentos Guardas has closed permanently. Do not plan on staying at these two locations, though they appear on some older maps. 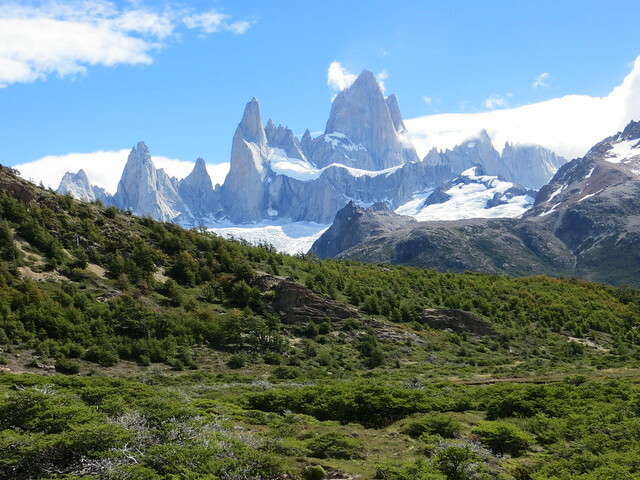 Lonely Planet “Trekking in the Patagonian Andes” has a nice day-by-day description of this hike and is a great resource. 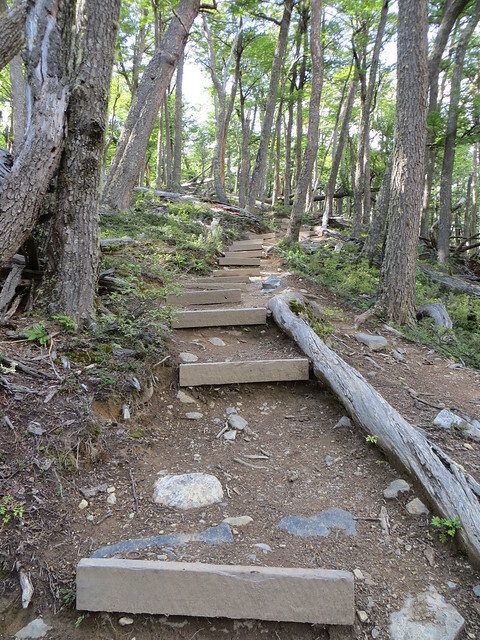 The park will provide a map that is more than adequate for hiking the well-marked trail (so no need to purchase one in advance). 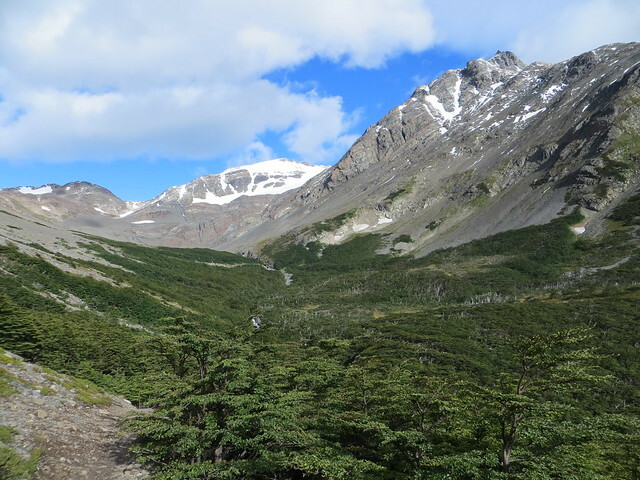 From all my research, it seems that people hiking the circuit are recommended to hike counterclockwise, beginning at Laguna Amarga or Camping/Hotel Las Torres. 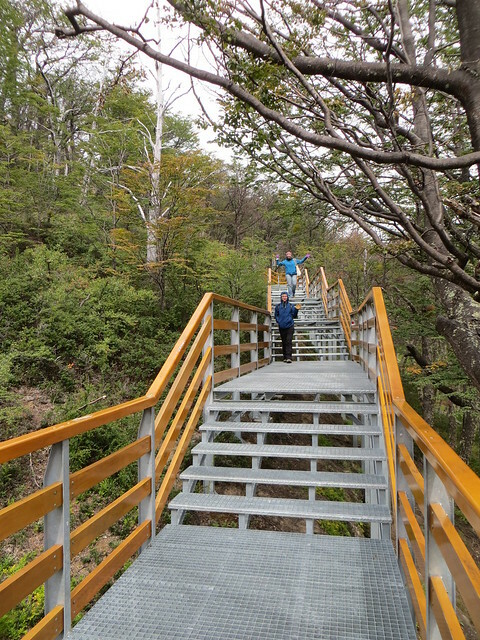 “W” hikers are recommended to start with the Lago Pehóe catamaran and work their way east. Stay: Erratic Rock Hostel (Baquedano 719) – This hostel is a bit pricier than some other places in town but worth every penny. Incredibly friendly and knowledgeable staff, comfy location and an amazing backpacker breakfast (plus, they have an insane VHS collection, so you can curl up in front of the fire or in the massage chair and watch Jurassic Park to your heart’s content). Getting there: Book your bus ticket to Torres del Paine through your hostel the day before. The tickets are round-trip and have no fixed return date. They cost around $33 USD. 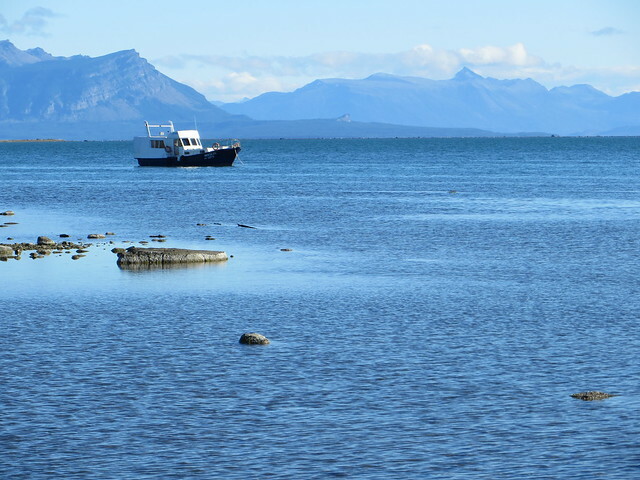 You can get to Puerto Natales by bus from Punta Arenas, Chile or El Calafate, Argentina. Book tickets at the local bus terminals. 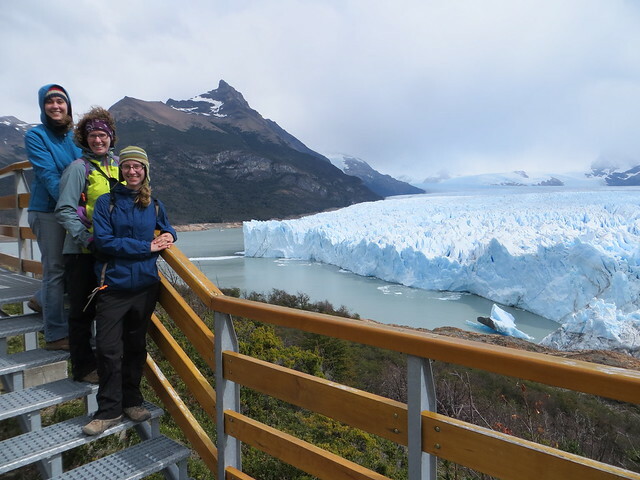 After a wonderful Patagonian welcome in El Chaltén, we headed back to El Calafate to meet up with Stephanie and check out the southern part of Los Glaciares National Park. 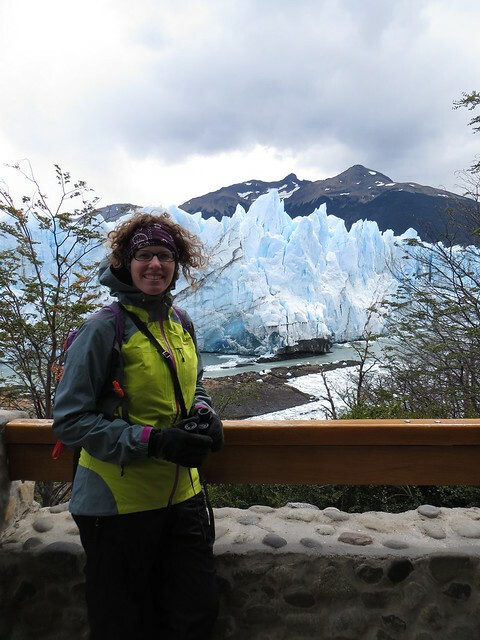 Steph got in to Calafate a day before us, which gave her some time to explore. 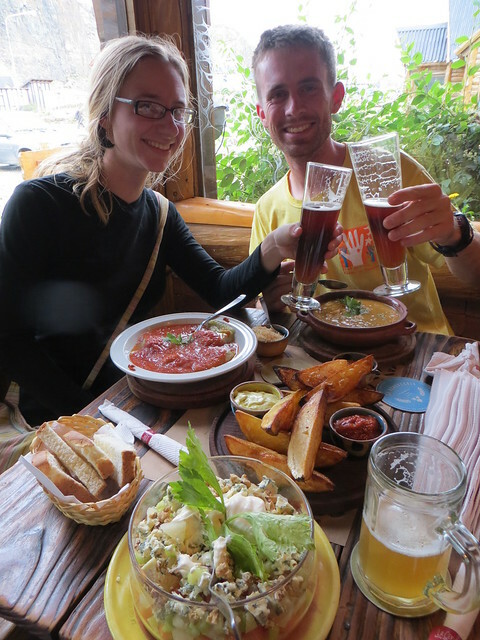 We caught up with her at our hostel, America del Sur and then went out for more delicious beer (Antares beer from the Mar de Plata region of Argentina – Thanks charming hostel desk guy for the recommendation) and dinner. Steph told us about a neat bird reserve nearby and we decided to make that our first stop the next morning. 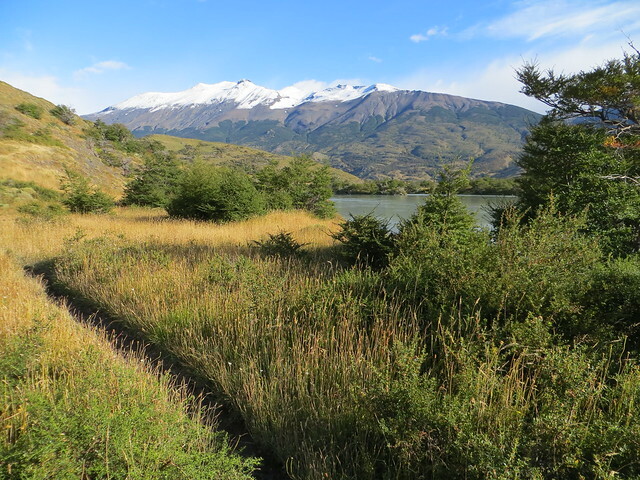 After a leisurely breakfast we took a 15-minute stroll through town to the edge of Lago Argentina where Laguna Nimez awaited. 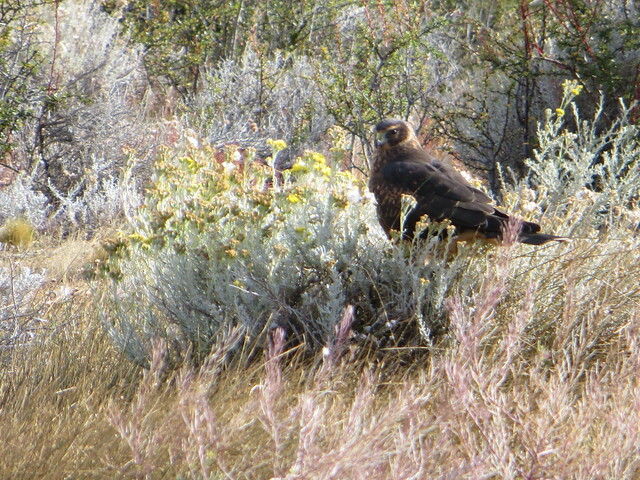 This Important Bird Area is frequented by more than 100 bird species and was a delight for me, a very amateur birder. 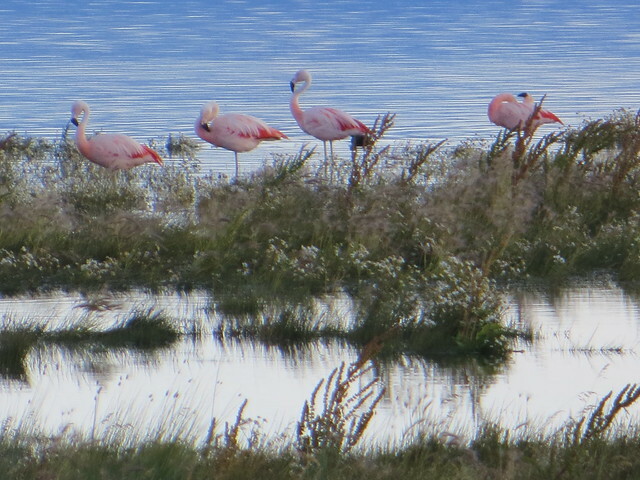 At the reserve I caught my first glimpse of flamingos in the wild, and had close encounters with a number of interesting species. The mountains in the distance make this a really lovely place to watch birds. 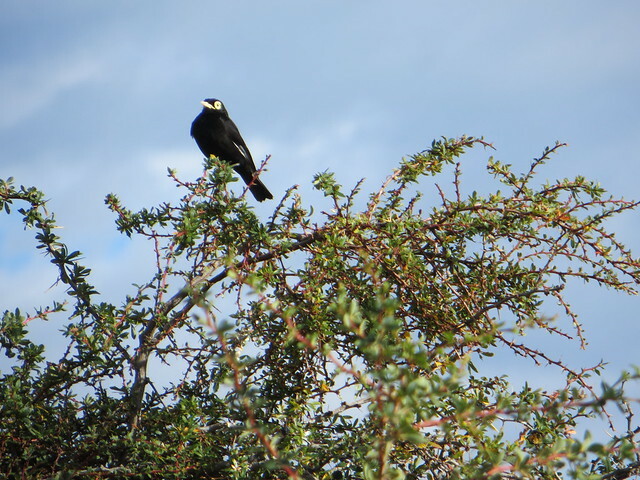 Steph rocked it on the ID of this one: Spectacled tyrant (Hymenops perspicillatus). Check out his great yellow eye ring! 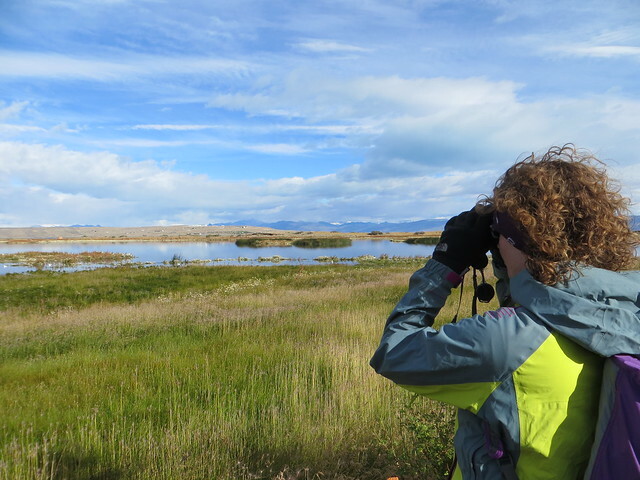 So many birds, so little time (and such pretty scenery). I was wishing we could stay here all day! 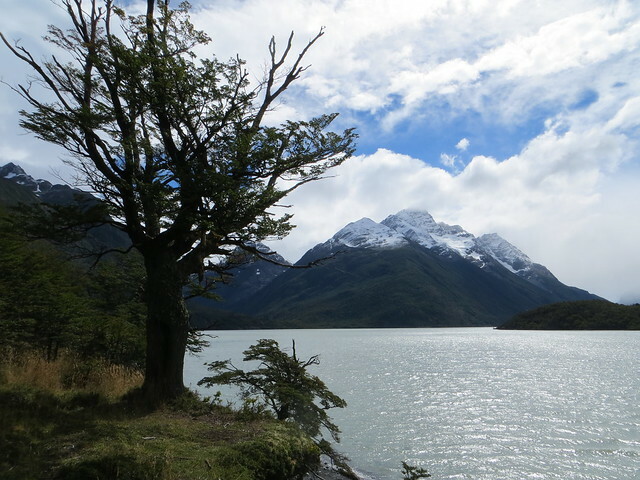 We left the reserve mid-morning so we could run some errands before catching the one o’clock bus to the Perito Moreno Glacier, in the southern portion of Los Glaciares National Park. 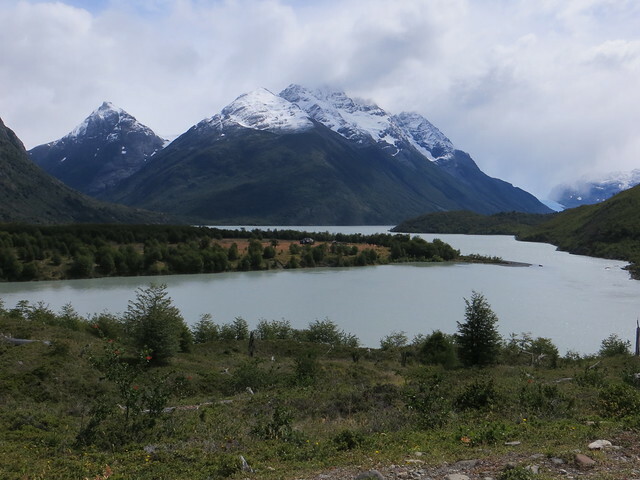 The bus travels along Lago Argentino for awhile and then swings into the park. The last part of the ride, snaking through the park towards the glacier is not for those who get easily carsick. 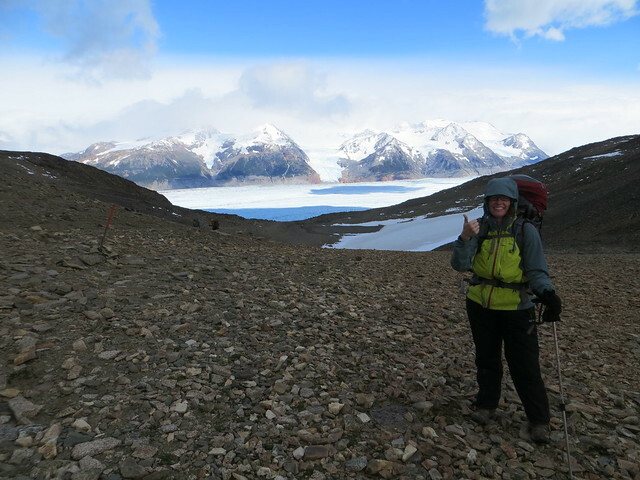 However, at a certain point on the road you get your first glimpse of the glacier off in the distance and you can temporarily forget the feeling in your stomach as you start gaping at the scenery. 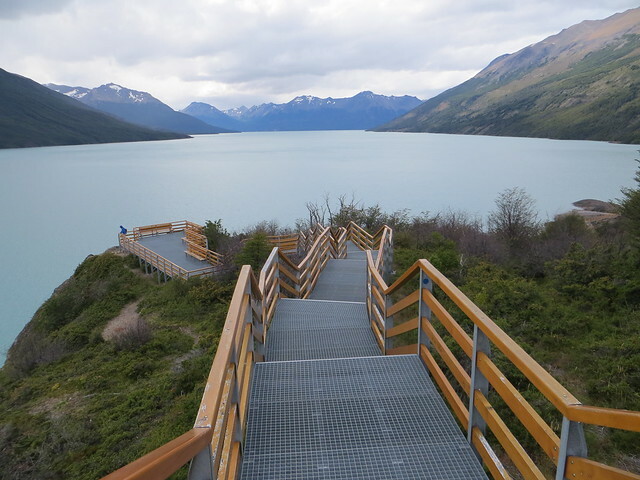 The buses make a short stop at the boat docks to let off passengers that want to see the glacier by boat, and then they drop everyone off on top of an extensive system of trails (all catwalks). There is a break in the trees shortly after you get off the bus and the whole glacier opens up before you. Before we went to the glacier, we weren’t really sure what we’d do with ourselves for all the time we would be at there (the bus back to Calafate didn’t leave until 7:30 p.m.). I find this funny now. I could have stared at this thing for days. 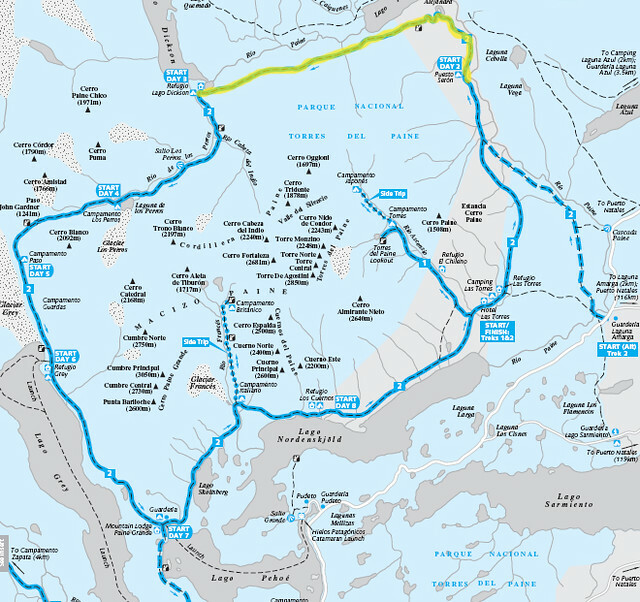 It’s around 60 meters high, 5 km wide at the terminus (the part you stare at) and goes back 14 km into the mountains. What we want: stuff to fall off this thing. Evidence suggests this has happened before. We climbed and descended hundreds of stairs as we explored all of the catwalks and trails, listening, looking and hoping for giant hunks of ice to fall off into the iceberg channel below. It was entrancing. I even caught sight of some Austral parakeets (who knew that parakeets lived places that look like this?). Steph and Chris staring at the glacier. 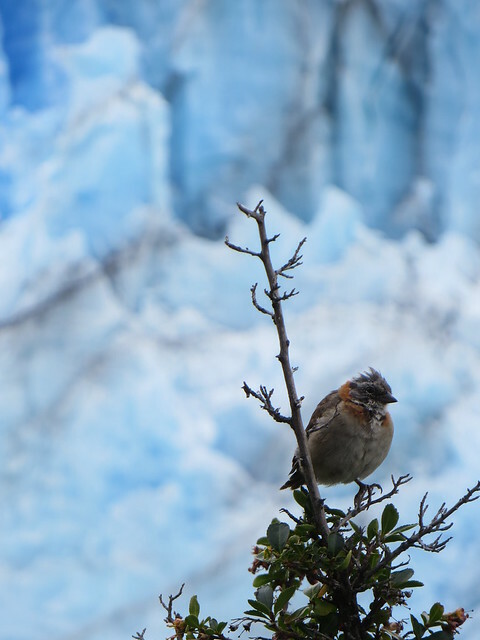 It was a magical place, and the first place I was able to really see how impressive the Patagonian ice field is. We enjoyed a snack on the patio at the café before boarding the bus back to Calafate (Bonus: a fun American medical student studying in Brazil entertained us on the way back. Double bonus: him and his girlfriend showed up at our hostel at all hours to have a drink with us. Chris: thanks for taking one for the team on that.). At the hostel we made dinner, packed and got a nice night’s sleep (minus Chris). We got up early to cook up some protein to supplement our breakfast (Lesson learned: when trying to give away extra food send the cute girl from Wisconsin, not the bearded, scruffy Coloradoan). 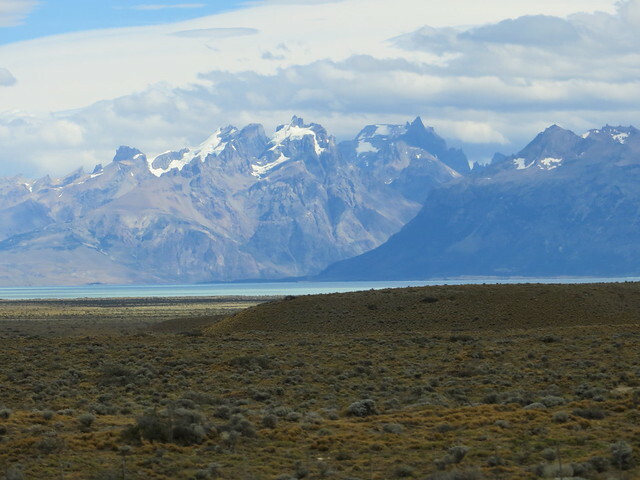 Then we said goodbye to Calafate and hopped a cab to the Chilean border and the epic trek that awaited us there (note: book buses further in advance to avoid need to pay for a 4-hour cab ride…The bus company will not accept your offer to stand for the 5-hour bus trip). 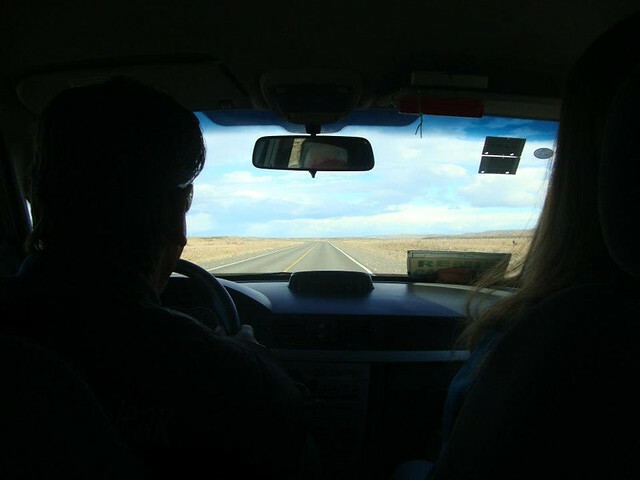 Cabbin’ it to Chile…not necessarily recommended but sometimes you must ask yourself: What would Vicky do? 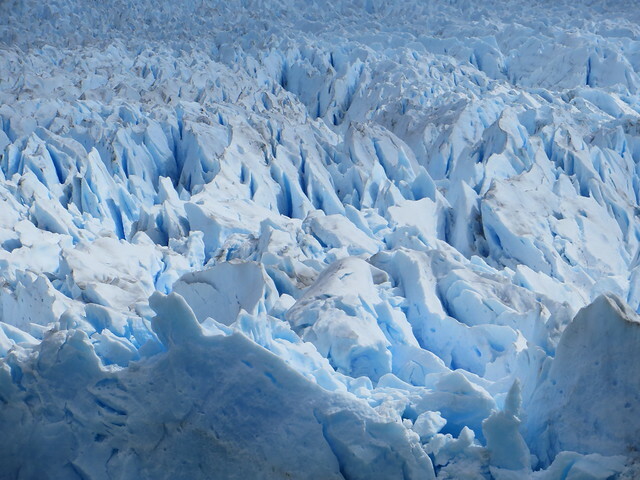 Check out all of my photos from Calafate and Los Glaciares southern unit on flickr. 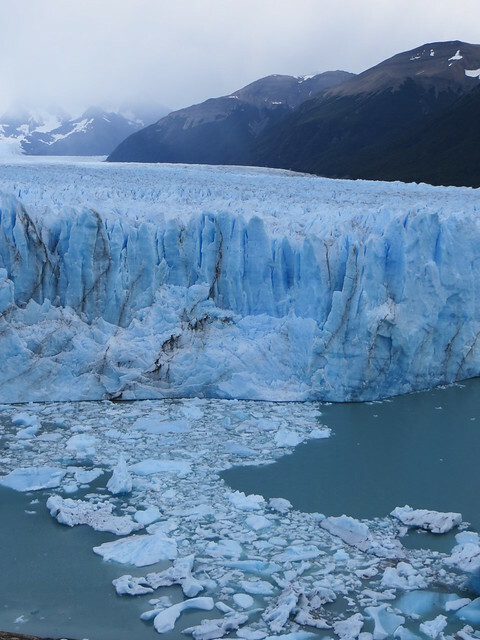 Go: Parque Nacional Los Glaciares – The south section of the park features the Perito Moreno Glacier, a must see spectacle of nature. 100 peso entry fee for Americans. Boat rides and excursions on to the glacier are available for an additional fee through Hielo y Aventura. If you go for the day, consider packing in a lunch, as the cafe on site is overpriced. 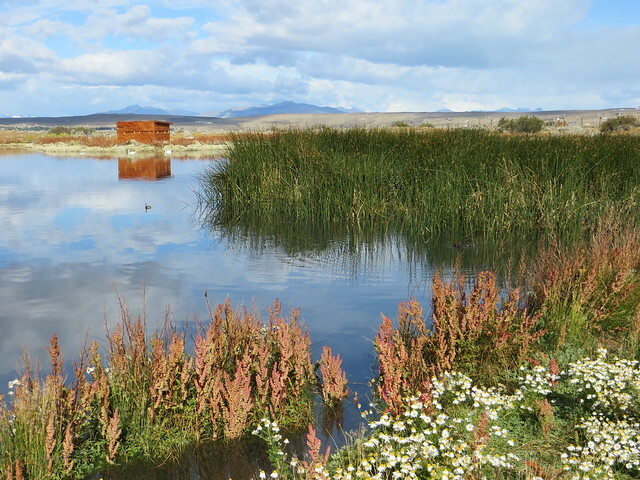 Reserva Municipal Laguna Nimez – Wonderful birding area/nature reserve on the edge of town. Of note: despite being a birding hotspot, this place doesn’t open until 9 am and closes at 8 pm. 35 peso entry fee for Americans. Stay: America del Sur Hostel (Puerto Deseado No 153) – Nice hostel up on the hill with nice views, a lovely common room, and great 4-bedroom dorms with smartly designed bathrooms (and heated floors-yay walking around in socks!). Getting there: El Calafate has a lovely airport (FTE) with many daily flights from Buenos Aires, Ushuaia and Bariloche. The airport is about 20 km out of town, so you’ll need to catch a cab or bus in to the city. The town also has a bus terminal (you can bus to El Calafate from various places in Argentina and Chile). 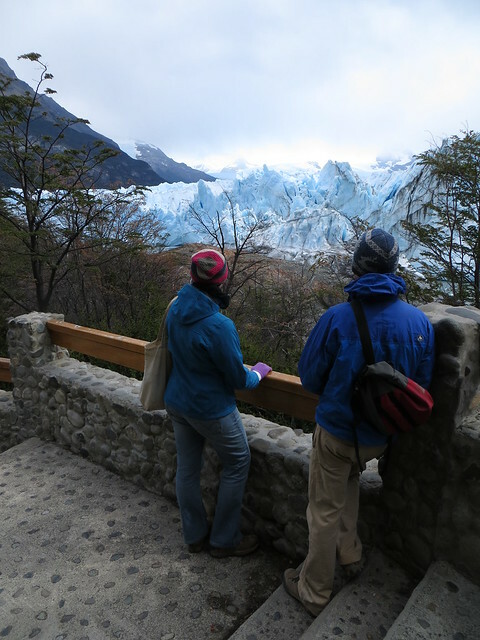 Buy your bus tickets to visit Parque Nacional Los Glaciers (departures from Calafate at 8:00 am or 1:00 pm, returns from Los Glacieres at 4:00 and 7:30 pm) at the terminal or through your hostel. Learn from our mistake and book your ticket out of town the second you get there (or you could be in for an expensive cab ride-which may have been illegal-or stuck in town a few extra days). 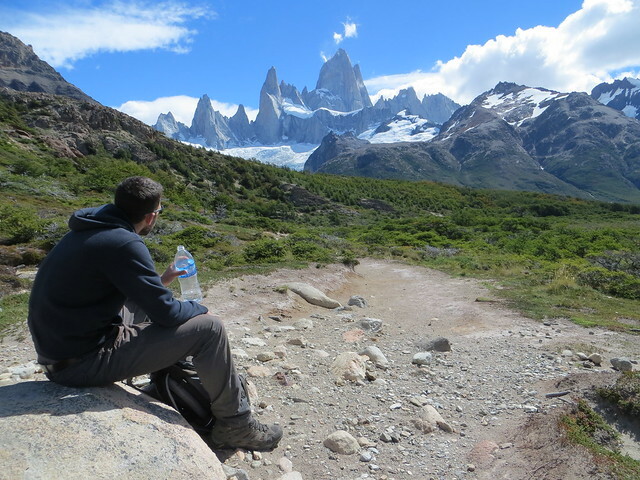 Visiting Patagonia was one of my travel goals during my Peace Corps service. I pictured myself enraptured by solitude and impressive scenery: alone at the end of the world. Lucky for me, the trip turned into something entirely more special: a shared experience of camaraderie and wonder. 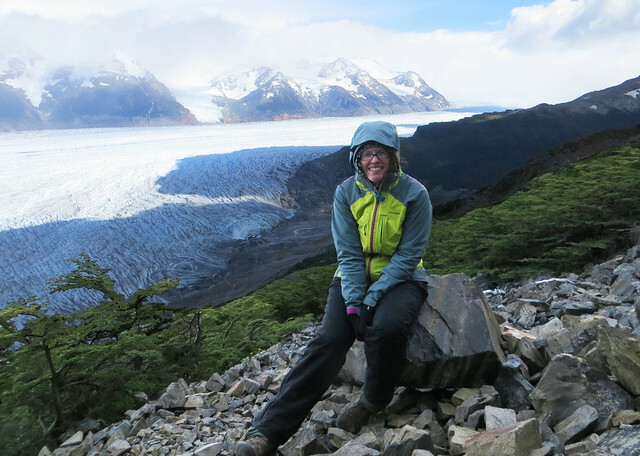 My fellow volunteer Julia expressed an early interest in planning a joint Patagonia trip, and the two of us set to work on a plan to visit Los Glaciares National Park in Argentina as well as Torres del Paine National Park in Chile. 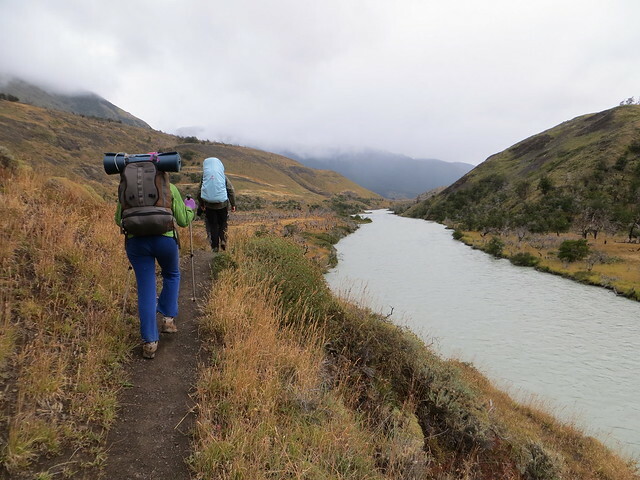 Our friend Chris, who joined me for my Peru trek, came aboard and then we picked up Stephanie, a greenhorn to backpacking, to round out our crew. 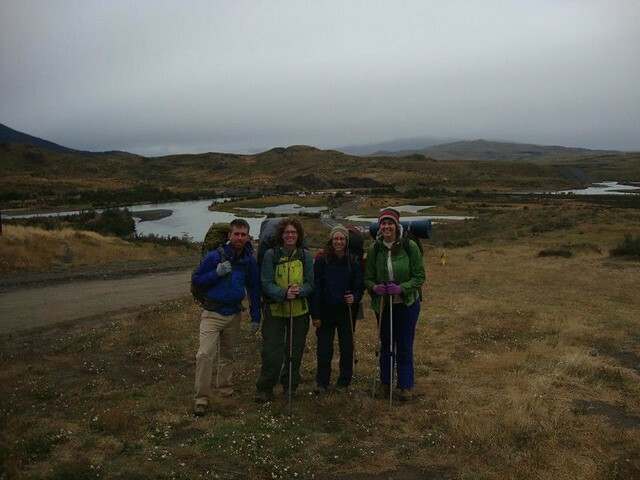 Chris, Julia and I set out from Asunción for El Calafate, Argentina, via Buenos Aires. 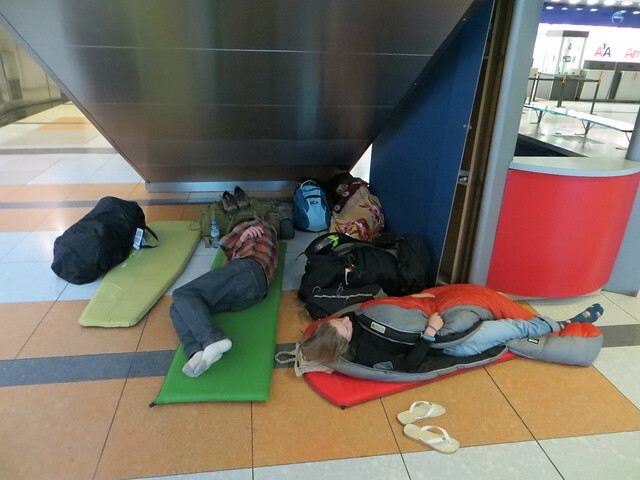 We had an overnight layover at EZE, where we staked out a choice piece of floor real estate to get some sleep. Setting the tone for the trip (the more the merrier) a random chick set up shop with us in our under-the-stairs hideaway. The random girl we didn’t know clearly got the best sleeping spot: the corner. 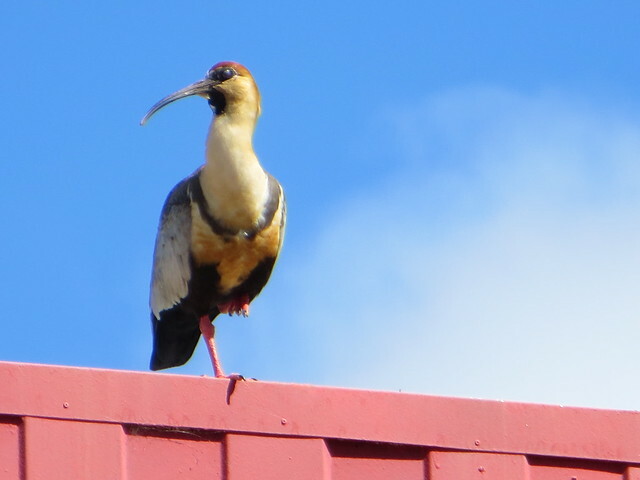 After a less-than-relaxing night, we jetted off to Calafate, where I watched birds while enjoying a savory waffle lunch (pineapple and cheese!). The three of us then caught a bus north to the town of El Chaltén, the gateway to trekking at Los Glaciares National Park. Chaltén is about 3 hours from Calafate and the bus ride prepared us for the typical Patagonia scenery: lonely rolling plains, speckled now and again with exotic wildlife (guanacos, flamingos, rheas), and broken by picturesque mountains, hypnotic glacial lakes, and on occasion, massive glaciers themselves. We got to the little town in the late afternoon, and were treated to a quick rundown of the national park’s trails by a friendly ranger. From there we checked-in to our hostel (the lovely Albergue Patagonia) at which point we noticed a peculiarity of Patagonia none of us had experience with: it doesn’t get dark out until 9:30 at night. In the spirit of “it’s still light out” we decided to take an 8 km hike out to the 20 meter Chorrillo del Salto waterfall. Though the hike involved mostly walking along a gravel road, it featured views of the nearby river, and it was nice to just be using my hiking boots. 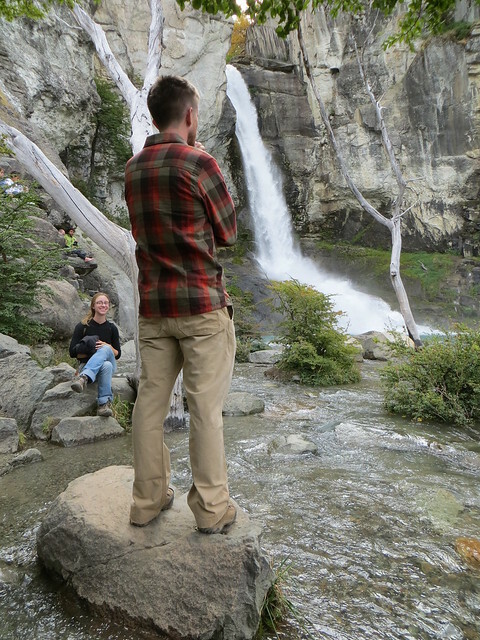 After meandering along the road, we headed down the short trail to the falls where we sat to take in the scenery and breathe the crisp air. We made it back to our hostel while it was still light out and asked the desk for a recommendation for the best beer in town. They directed us a few doors down to La Cervecería, a microbrewery with their own bock and lager. This cozy restaurant had a lovely ambiance, great food, and most importantly delicious beer. During dinner we struck up a conversation with a cool Israeli named Ori, who was enjoying locro and a beer at the table next to ours. We all decided that since we were planning the same hike the next day, we should surely do it together. Julie and Chris enjoying dinner at the Cervecería. Yay good beer! Ori met us as we were finishing up breakfast the next day and we set off up the main street to the edge of town where the trail to Mount Fitz Roy begins. 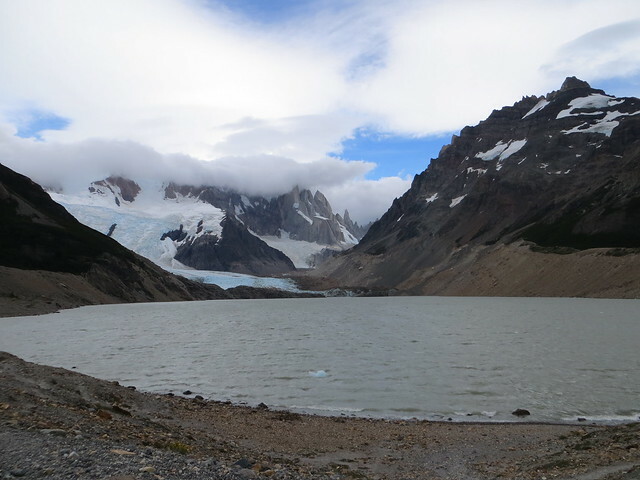 Our destination was the Laguna de los Tres, a glacial lake at the base of Fitz Roy (the most famous of Argentina’s peaks). 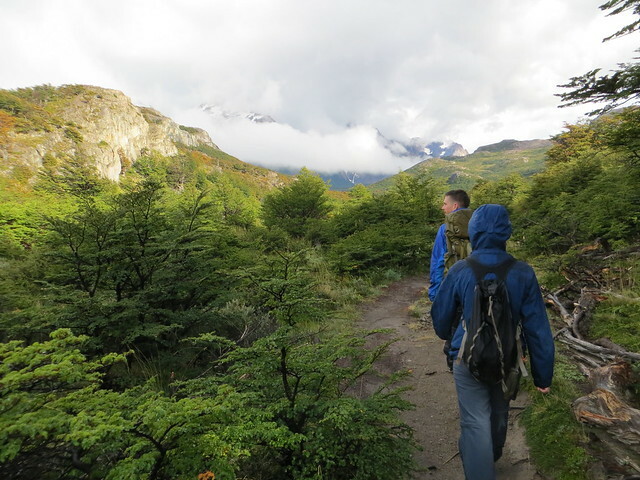 Patagonia welcomed us to the hike with its predictably unpredictable weather: clear, then drizzle, then rain, then clear again, with crazy winds on and off all day long for good measure. 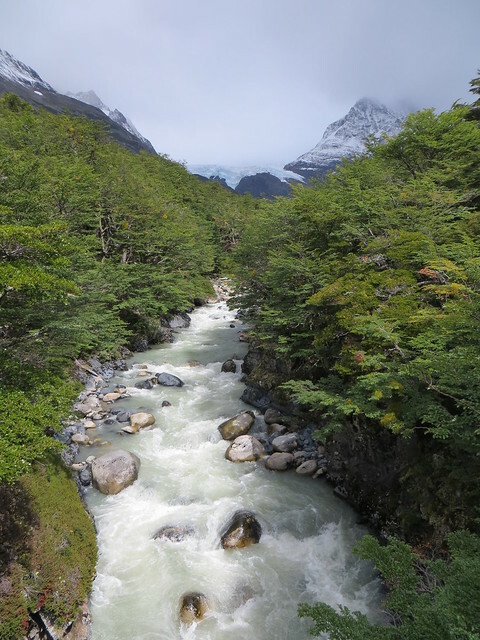 The 21 km hike climbed slowly from the river valley up through forests and open spaces to the climbing camp Campamento Rio Blanco. From there the trail climbed steeply (400 meters gain in 2.5 km) to the Laguna de los Tres, a beautiful, and windy, spot where we gaped at the scenery (including Fitz Roy’s summit engulfed by clouds), had lunch, filled up our water bottles from the lake, and explored (while trying to not get blown to our deaths). It was stunning. Commence staring. We’ve reached our destination. 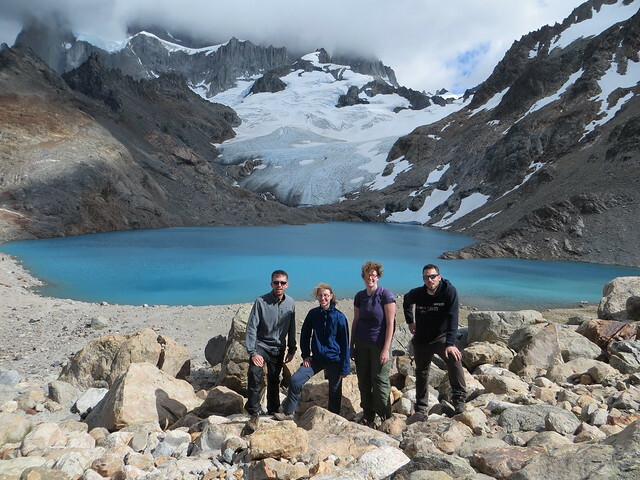 Chris, Julie, me and Ori in front of Laguna de los 3. 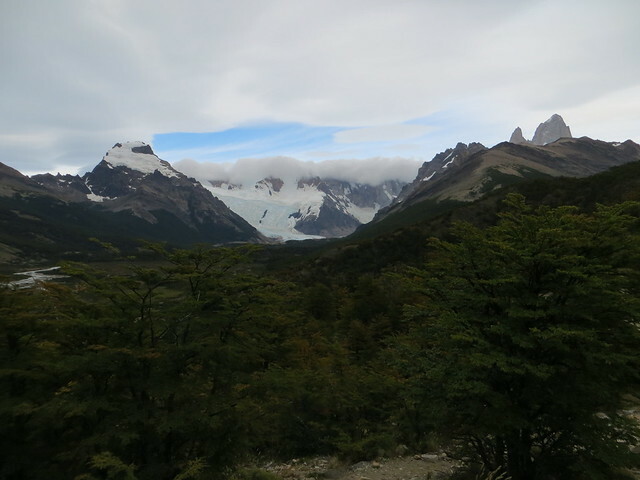 Fitz Roy is above, shrouded in clouds. 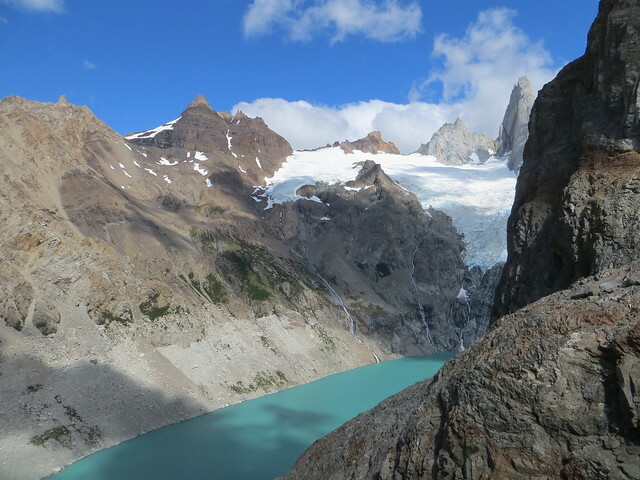 Laguna Sucia below Laguna de los Tres. Misnomer? Chris demonstrating the strong winds. Chris and Julie decided to take a detour on the way back to another glacial lake, while Ori and I went to a nearby overlook. 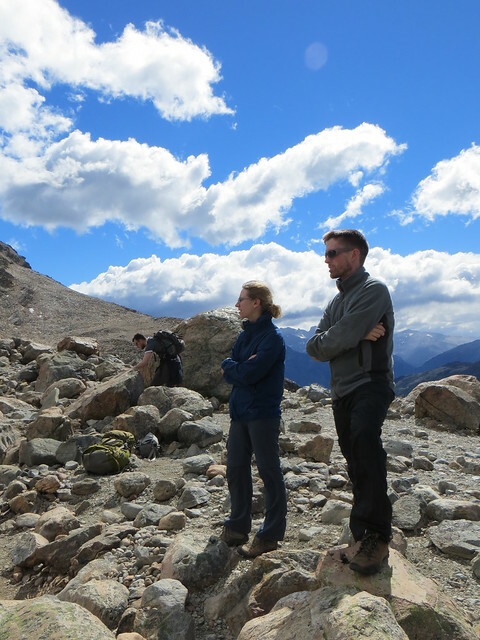 On our way back, the clouds parted from Fitz Roy’s summit and we sat to take in the view. Heading back down I nearly killed myself tripping downhill when I spotted this Magellanic woodpecker. Totally worth it. With the rain gone, the hike down made for some lovely scenery. Mount Fitz Roy decided to come out from the clouds. I couldn’t look away. 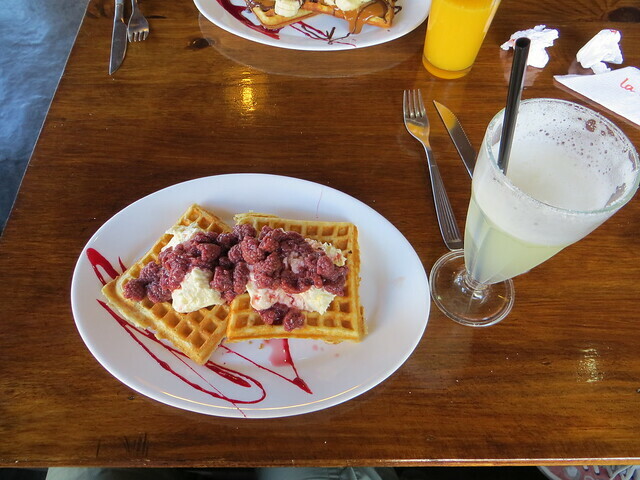 After the hike we enjoyed some sweet waffles at the local Waflería (they do exist!). We went back to our favorite Cervecería for dinner and said goodbye to Ori, who was continuing on to Cueva de los Manos and Bariloche. The next morning we did the 19 km hike to Laguna Torre, who unlike Fitz Roy, decided not to give us a view. 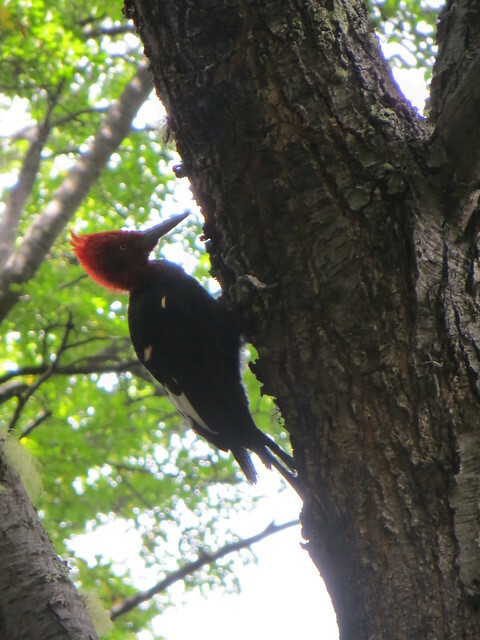 It was still a relaxing hike with nice views of mountains, streams and birds. We got to the lake only to be met by the most misery-inducing winds of the trip. They were so strong and chilly that Julie and I decided we had seen enough of the lake after about 5 minutes and headed back to find a more sheltered place to enjoy our lunch. The Torres that give the lake its name, hidden in the clouds. After the hike we relaxed in town for a few hours before catching a bus back to El Calafate to meet up with Stephanie and continue our trip. 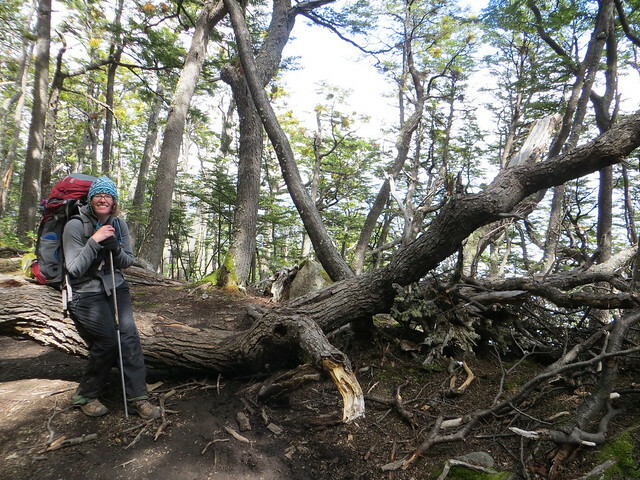 El Chaltén ended up being a wonderful introduction to trekking in Patagonia, and left me energized for what was to come. 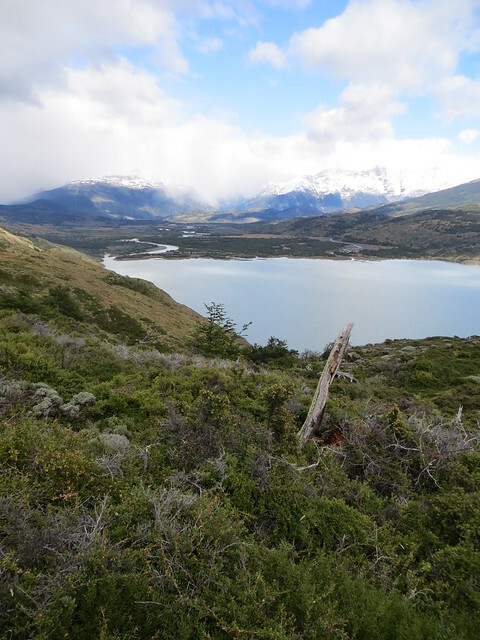 Go: Parque Nacional Los Glaciares – North section as of this writing has no entry fee. Most buses coming into town will stop at the park visitor center on their way in. Pick up a map and get a trail rundown there. Stay: Albergue Patagonia (San Martín 392)– Incredibly chill hostel with cozy 4 bed dorms, located conveniently close to good beer. $18 a night during high season. Eat: La Cervecería (San Martín 320) – Try the microbrews and the locro (Argentine stew). La Waflería (San Martín 640) – I highly recommend the raspberry and cream waffles. 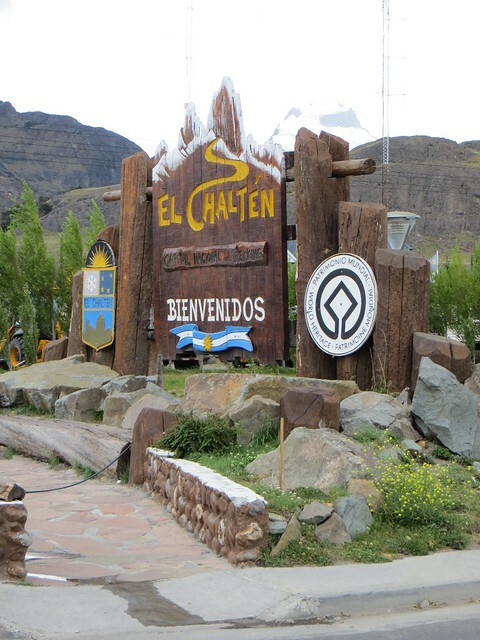 Getting There: Buses leave El Calafate multiple times per day to make the 3-hour trip. 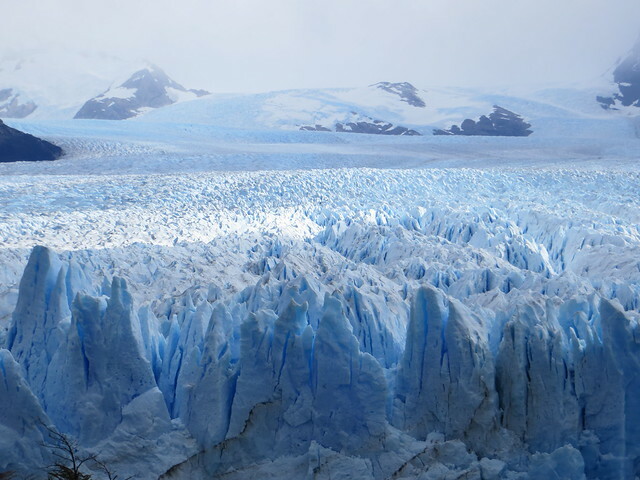 As of this writing Calafate to Chaltén during high season: 8:00, 13:00 and 18:30 and Chaltén to Calafate: 7:30, 8:00, 13:00 and 18:30. Price is about $43 roundtrip. Buy tickets and get up-to-date schedules at the towns’ bus terminals. 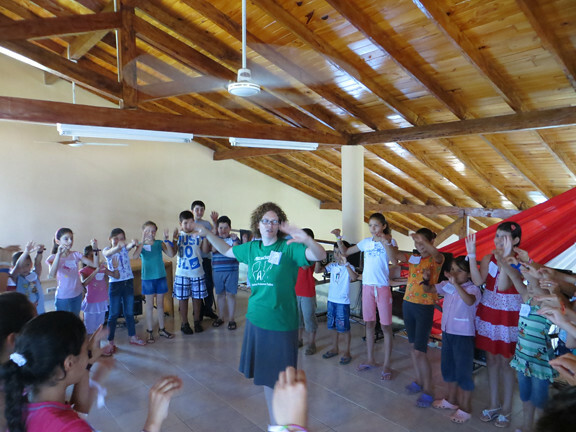 I’m finally in the last few weeks of what I have taken to calling “The summer of camps.” It started in December, when school let out, with 2 week-long Animal Camps (one at the local Cultural Center and one at the local soup kitchen). 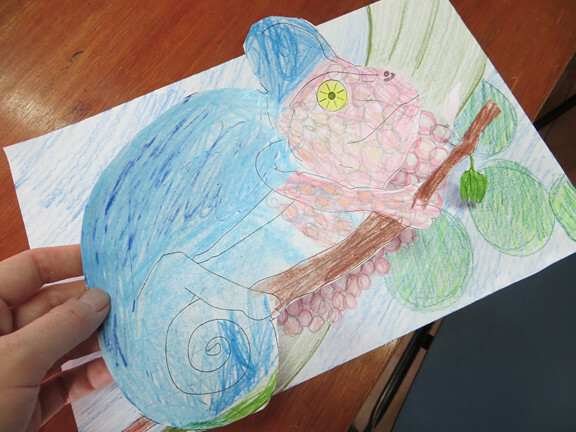 I developed and planned these camps to focus around animal adaptations. 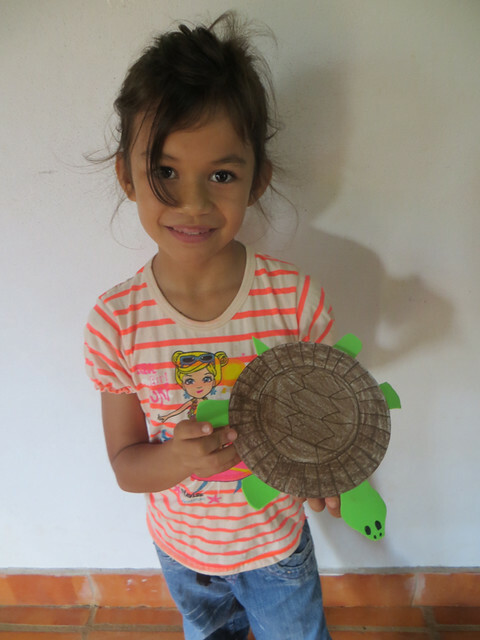 Through crafts, activities and games the kids learned about the 5 classes of vertebrates and some of their most useful and interesting adaptations. 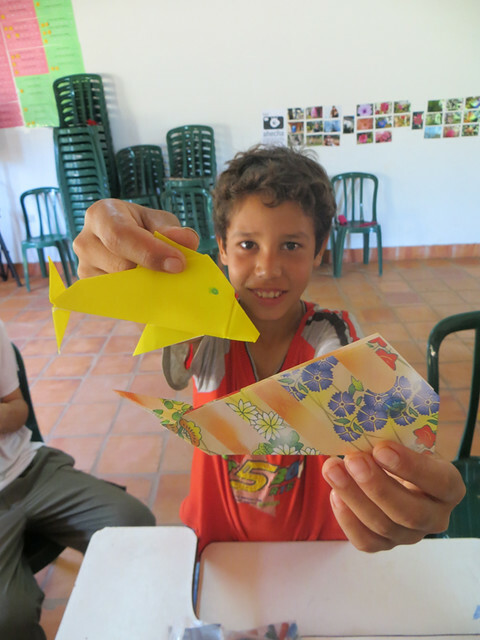 and whale and dolphin origami. 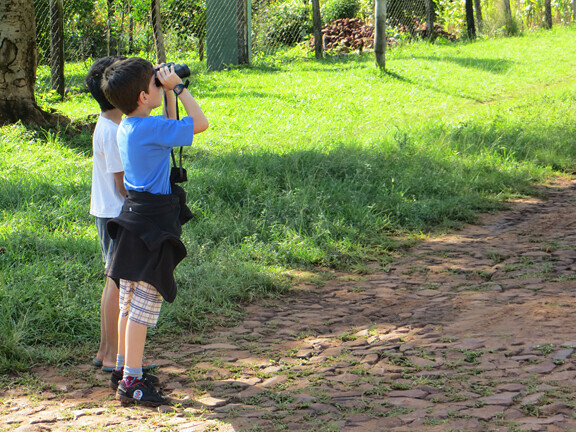 One of the groups even got to go out birdwatching with me. After wrapping up Animal Camp I dived right into a Personal Development Camp that I helped my youth group plan and execute. 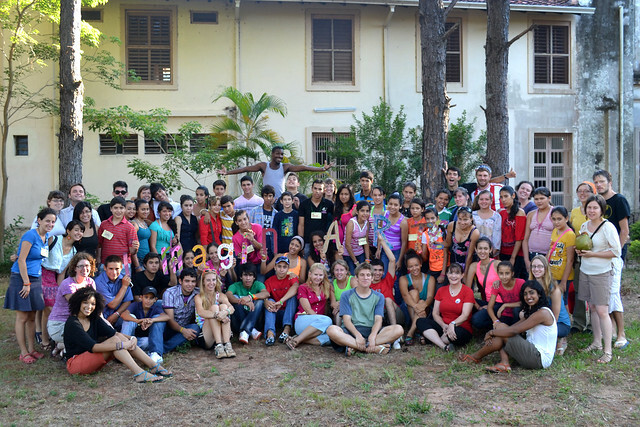 My youth group and the kids that attended their Personal Development Camp. 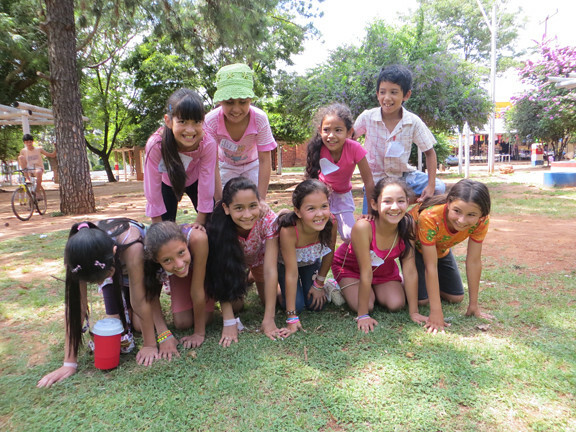 This 3-day camp focused on self-esteem, communication and working in groups. It featured a ton of icebreakers and other high energy activities, including a scavenger hunt. The kids attending had a blast. I was so proud of my youth group for putting the event on. My youth group! Luz, Pablo, Alba, Lucas and Sofia. These teens are amazing. 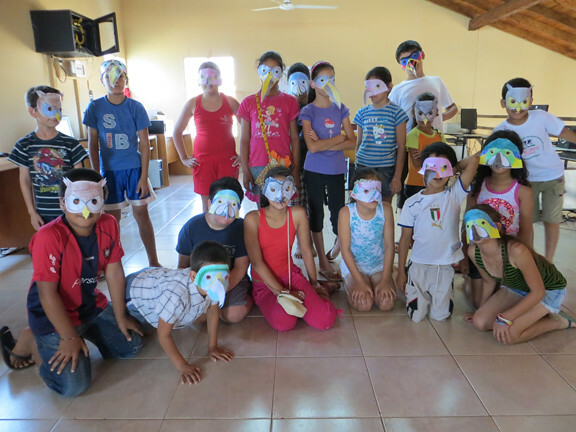 It went so well, they partnered with another youth group (1 ½ hours away in Carmen del Parana) to modify some of the activities to create a 3 hour activity day for kids there. Again, I was just bursting with pride. 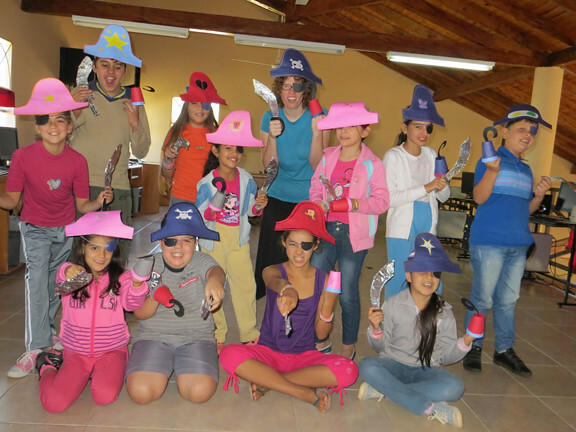 Between the two events they worked with around 70 kids! 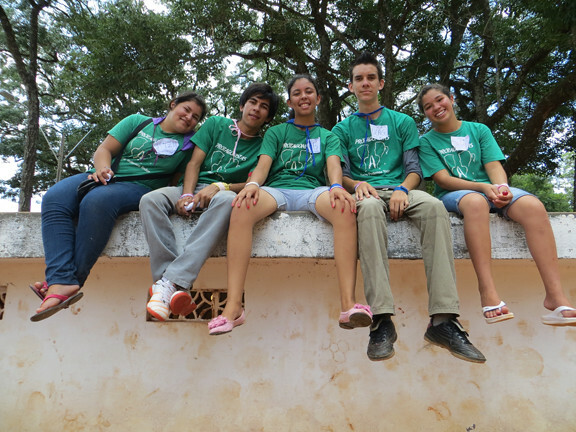 In January I brought 3 youth from my community to my sector’s national leadership camp Youth for Paraguay. At this 4-day event, the youth participated in a variety of activities where they learned skills to bring back to their communities. 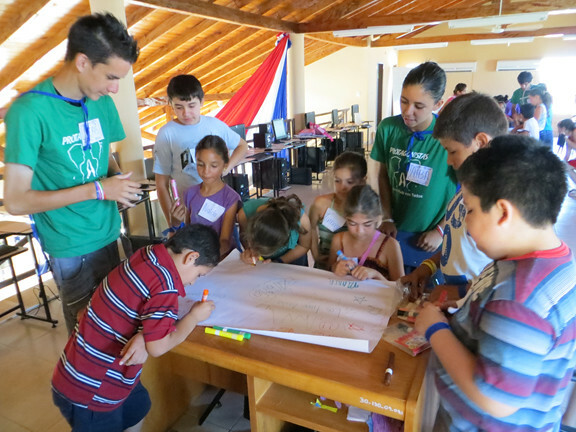 I helped lead a “How to use Google Mapmaker to map your city” activity during the camp. I also did a presentation for all of the kids, with my friend Julie, on using marketing to help promote their youth groups. Just before the camp, my friend Molly (who organized all of the fabulous programming for the camp) asked me to help design a mural for some of the attendees to paint during the event. We did some sort of weird mind meld and came up with a great design. It was awesome to see the finished product at the end of the camp. 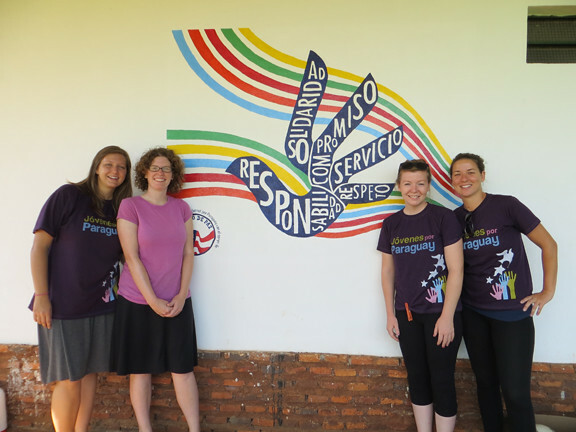 The finished mural and the team who helped to make it happen: Molly and Amy on idea and design, and Anna and Jess on painting. Our Country Director liked my design so much she asked if we could paint the same mural in the office. We’ll see if that pans out. Overall, the camp was great and my youth group members came back even more motivated to do great things in our community. Immediately after the leadership camp I was overwhelmed by last minute preparations for our new national art camp, Imaginarte. A team of wonderful ladies from my training group (Joanna, Vicky, Molly, Shavon & Ginsey) and I created this camp from scratch this year. Molly and I were in charge of programming for the 3-day event. 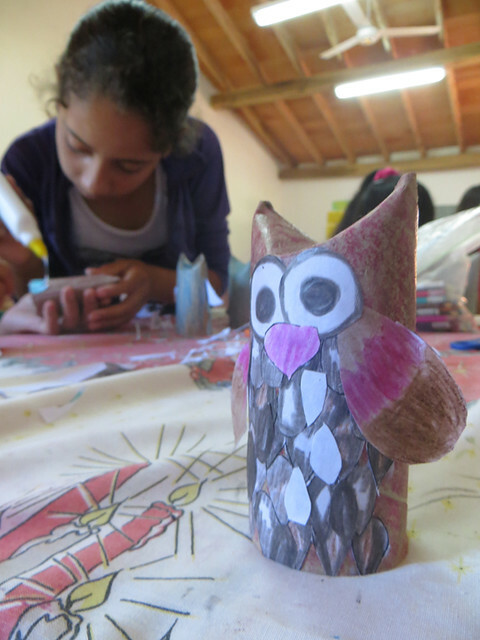 The idea of the camp was to foster creativity, teach kids about opportunities to incorporate art in their daily lives, and introduce them to real artists. It exceeded my expectations in every possible way. 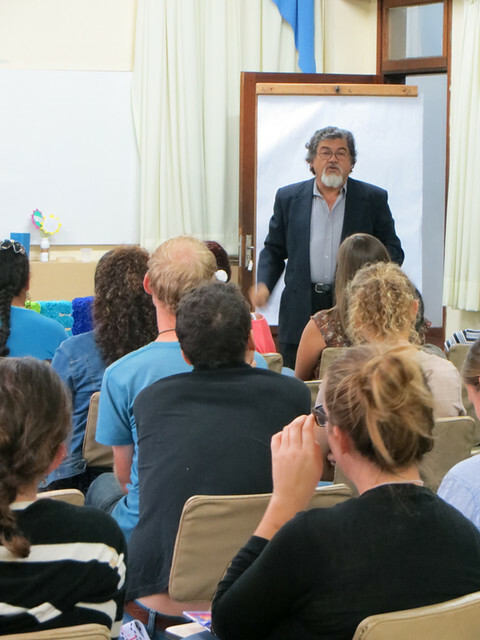 We had wonderful speakers come in, including 2 professional photographers, an actor from the most famous movie in Paraguay, and a well-known graffiti artist. 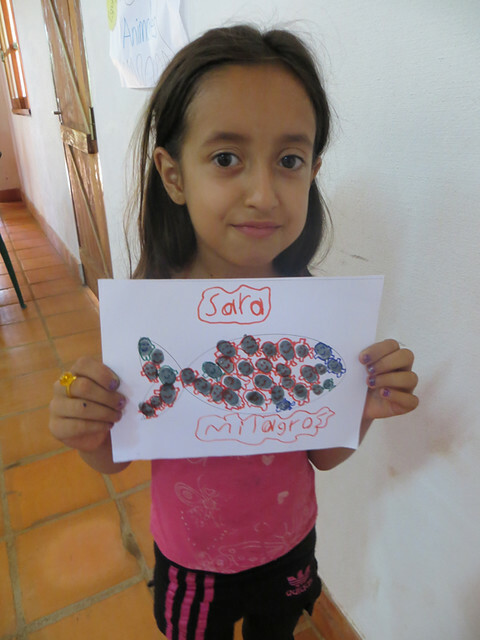 Additionally the kids got to explore the artsy town of Aregua, where we hosted the camp, on a photo safari and a gallery walk. 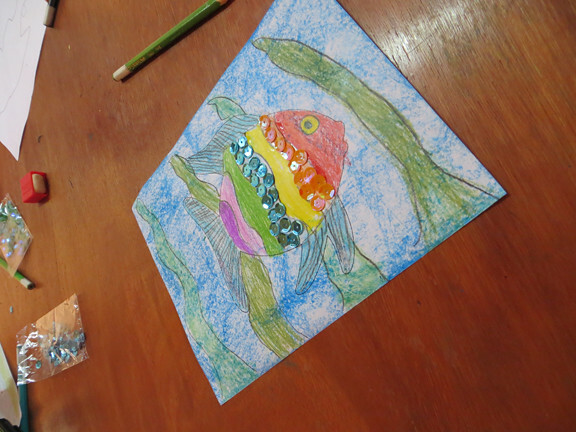 We did a ton of activities involving creativity, art and writing throughout the event and we finished each night with a big 3-hour open studio. 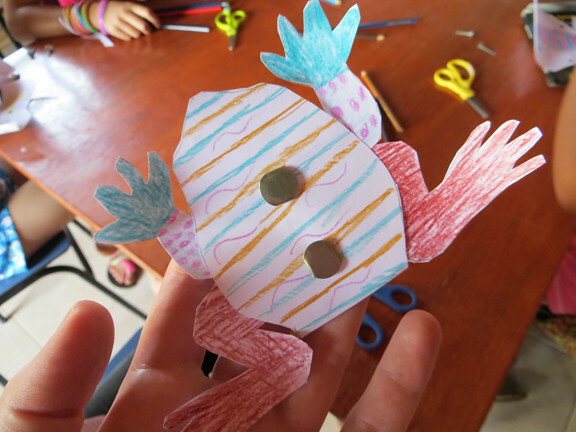 During that time the kids basically had a craft store worth of supplies and free reign to create whatever it is they wanted. It was amazing to see some of their creations. 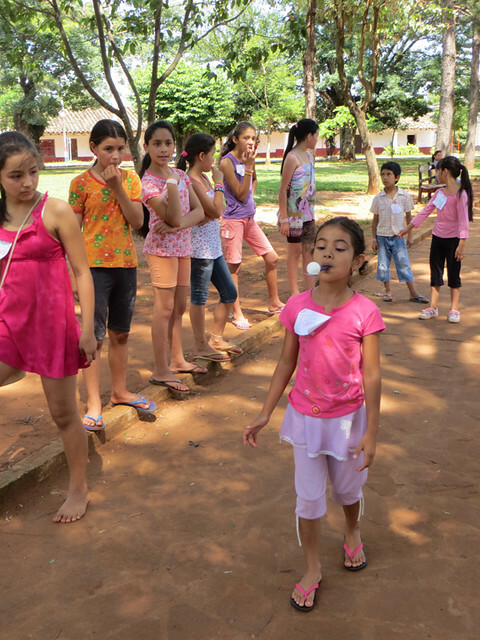 Typically when you do a camp in Paraguay, you print up a fancy t-shirt and give it to the participants as their souvenir from camp. I thought that wasn’t very creative so I had the idea to have the kids paint their own Alpargatos (a type of shoes that look like Tom’s) and take those home instead. We painted the shoes the first night and then the second night we filmed a Footloose-inspired video of them dancing in their shoes. It was a huge hit. 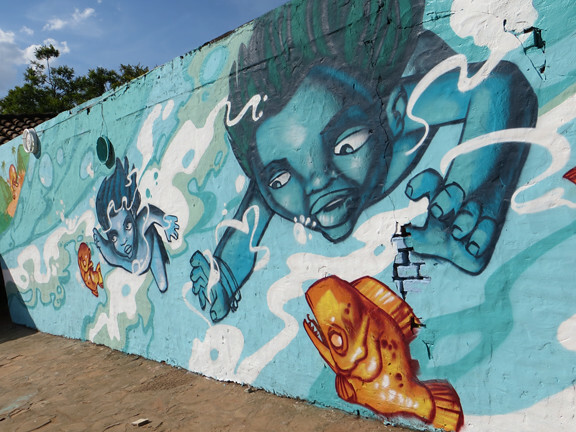 One super special thing we did during the camp was paint a mural with the help of Oz Montania, a well-known graffiti artist. It turned out wonderfully. I left that camp sort of amazed at how well it went…only to realize I had no time to relax as I started a History Camp in my site the next day. In this camp I decided to use a book series called “You wouldn’t want to be a….” for inspiration. We own 5 of these books in our library, so I used them to choose the time periods for my camp: Ancient Greece, the Middle Ages, the Age of the Aztecs, the Age of Exploration (Columbus, Magellan, etc) and the Age of Pirates! Each day we learned a bit about the culture or time period we were discussing and put them on the timeline and map. 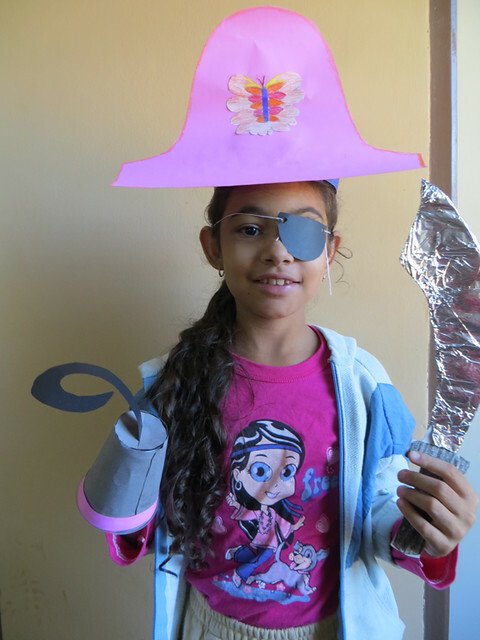 Then we made a costume and other crafts, as well as played games related to the day’s theme. On Ancient Greece day we had a mini-Olympics. 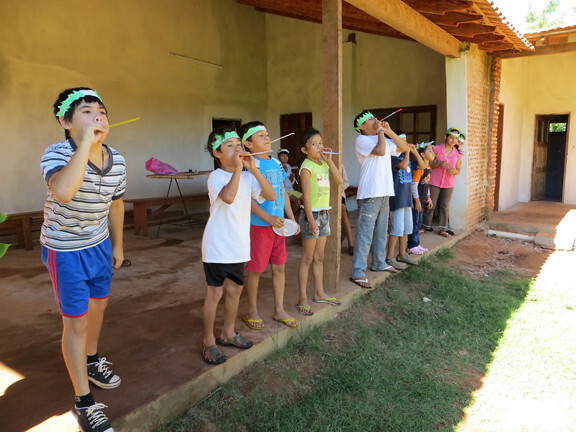 This is the straw/paper javelin throw. I did the camp for one week at the Cultural Center and am in the middle of doing it a second time at the soup kitchen this week. 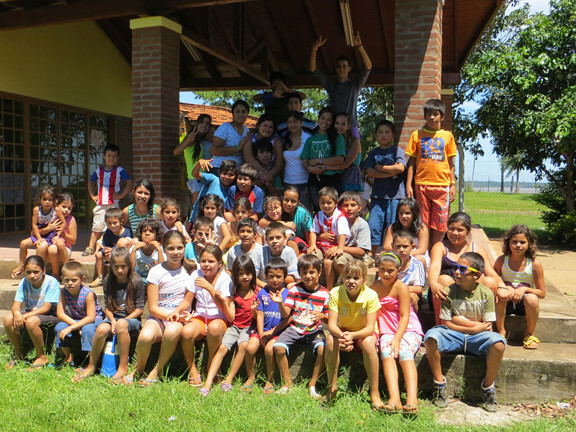 After I wrap up week 2 of History Camp, I’m off to our Apprentice Challenge National Business Camp in Asunción. I worked as the communications chair on this event, so it should be fun to attend and help out. My youth, Carmen, who won the National Business Plan Competition in August is going to come the last day to talk about her business and experience participating in the program. Check out a video of her below. After the business camp, I’m back in site for a week-long Science Camp which I’m putting on, and a simultaneous Leadership Camp that my youth group is doing. When those are over I get to get on a bus headed for the airport in Asuncion where I’ll be flying out for a 2-week trip to Patagonia. After this summer of camps, it will be nice to finally relax and cool off. 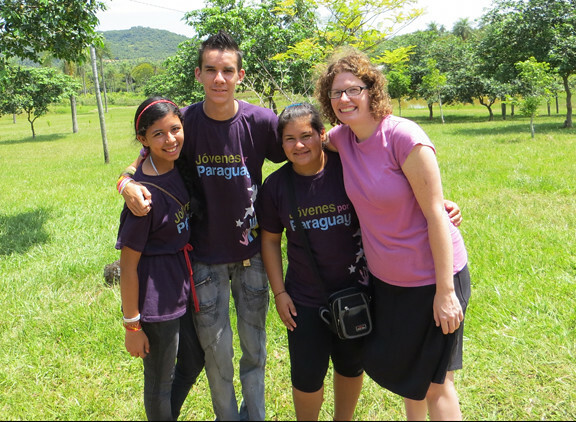 When I return I’ll have a little less than 5 months left of Peace Corps service. My focus for the first 2 months of that will be getting the National Library Workshop together. 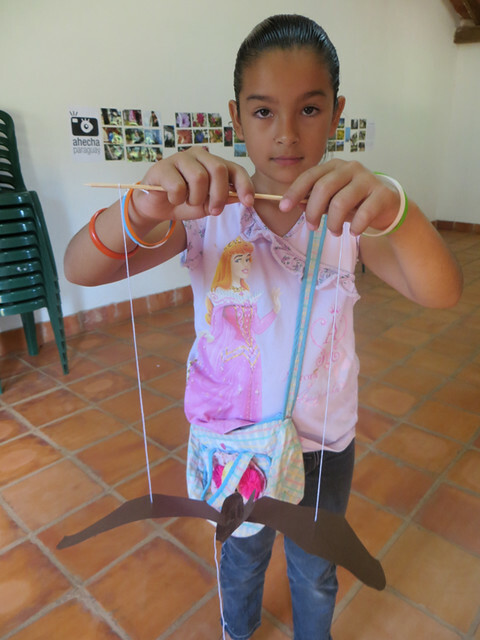 If you haven’t already done so, please consider donating to help make this workshop a reality at http://tinyurl.com/LibraryTaller2013 . Every dollar counts and we’re well on our way to being able to fund this important event (read more about why I’m planning this workshop in this blog post). 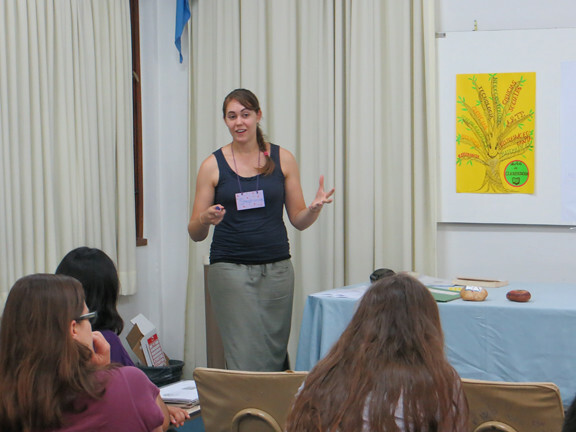 I’m hoping that sharing some of my camp experiences at the library workshop will help motivate Paraguayans to offer similar events in their sites. Those of you who know me probably know I’m a reader and a library-holic. Serving in the Peace Corps has been a great opportunity to put a dent in my “to read” list (up around 110 books read so far during my service) but it has also been an eye opener about how much we in the United States take our libraries for granted. I miss my libraries (Warren-Newport, Cook Memorial and Douglas County) on a daily basis. I could go to them for work-related information, the latest science fiction novel, help and book recommendations from a librarian, a comfy place to accomplish work, a connection to the World Wide Web, interesting programs, and the pleasure of perusing the stacks on a treasure hunt for the unknown. 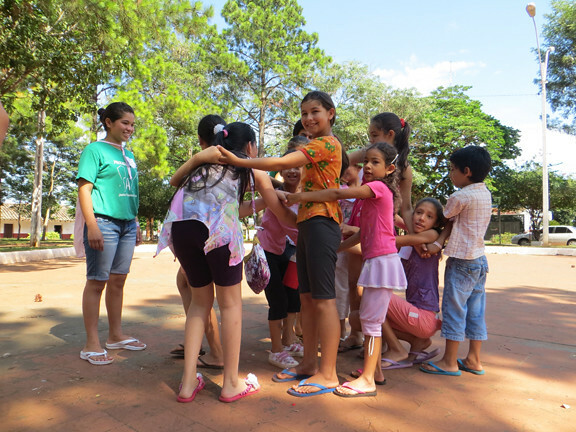 Most people in Paraguay don’t have access to any of those things because libraries are either non-existent or inadequate (lack of staff, lack of training, lack of resources, lack of knowledge, and lack of interest). 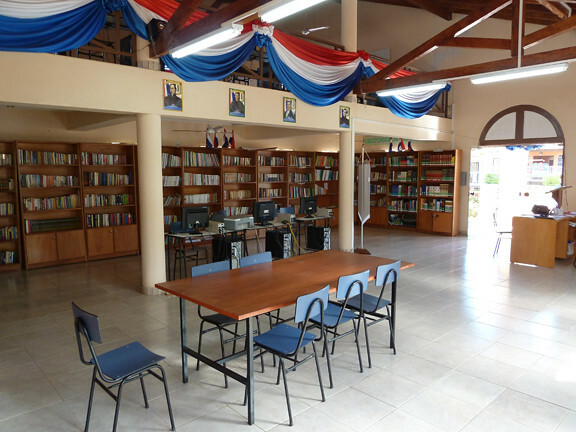 My town’s library – created with the help of another Peace Corps volunteer in 2009 – one of the finest in the country. 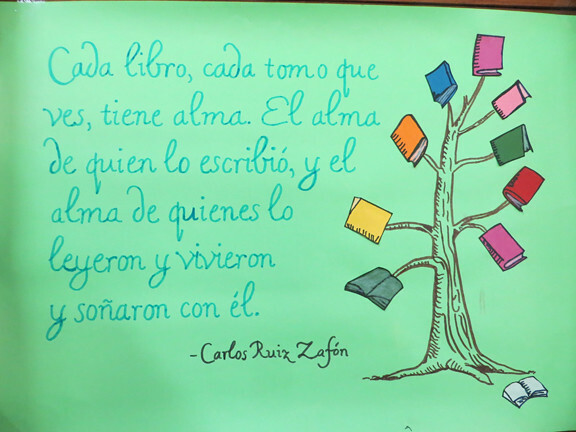 I am fortunate to live in a town in Paraguay that has a public library (a rarity) but a lack of training on the part of the staff and a lack of motivation to read on the part of normal Paraguayans means that this incredible resource is heartbreakingly underused. 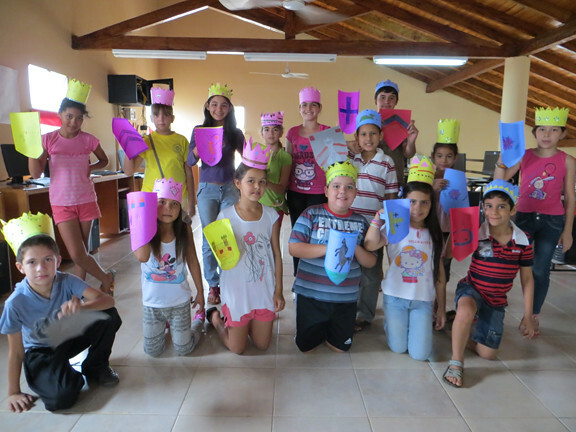 I have been working with the library during my service to incorporate technology in promotion and cataloging and have started a reading club, camps and other activities to promote interest in reading. These have turned out to be some of the most rewarding projects I’ve worked on. 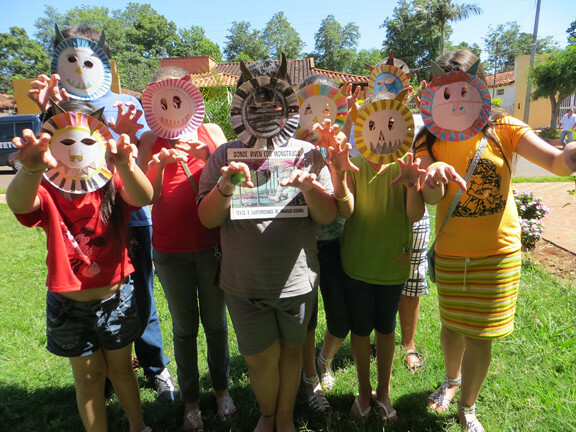 My reading club with their “Where the Wild Things Are” monster masks. Reading and Culture Camp kids using reference books to do country reports. Last May I brought one of the library staff to a national library workshop, where we both learned a lot about how to make our library better and how to engage our community. After the workshop, we both came back energized to make changes. This year I decided that I needed to see this library workshop continue and grow, so I am serving as one of the coordinators for the 2013 event. 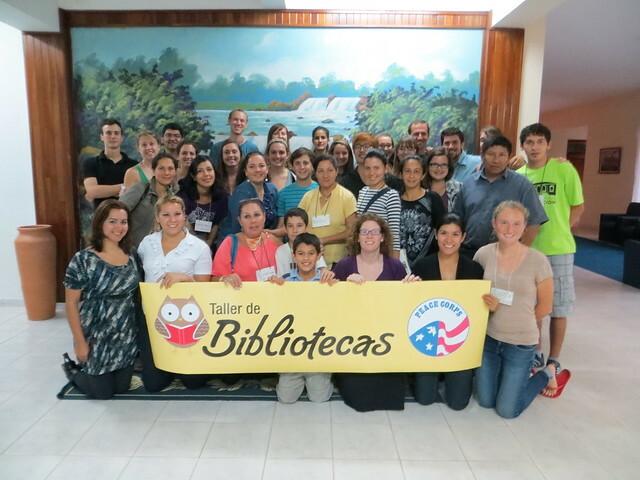 The 2013 Library Workshop will bring together 30 Paraguayan librarians (from school libraries and public libraries, as well as communities looking to start a library) along with 30 Peace Corps volunteers for two days of presentations and hands-on activities. 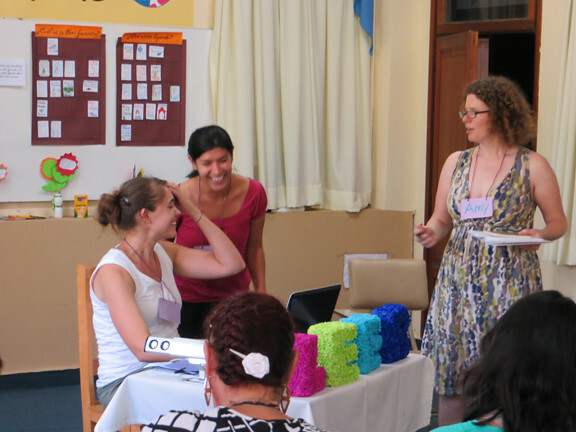 Participants will learn about a variety of topics including managing their libraries, motivating readers, obtaining resources, using technology, and caring for and repairing materials. I am extremely excited to be working on this project and feel it will be a memorable and meaningful way to begin to wrap up my service. Thanks for following me on this journey everyone, and thanks for your support!